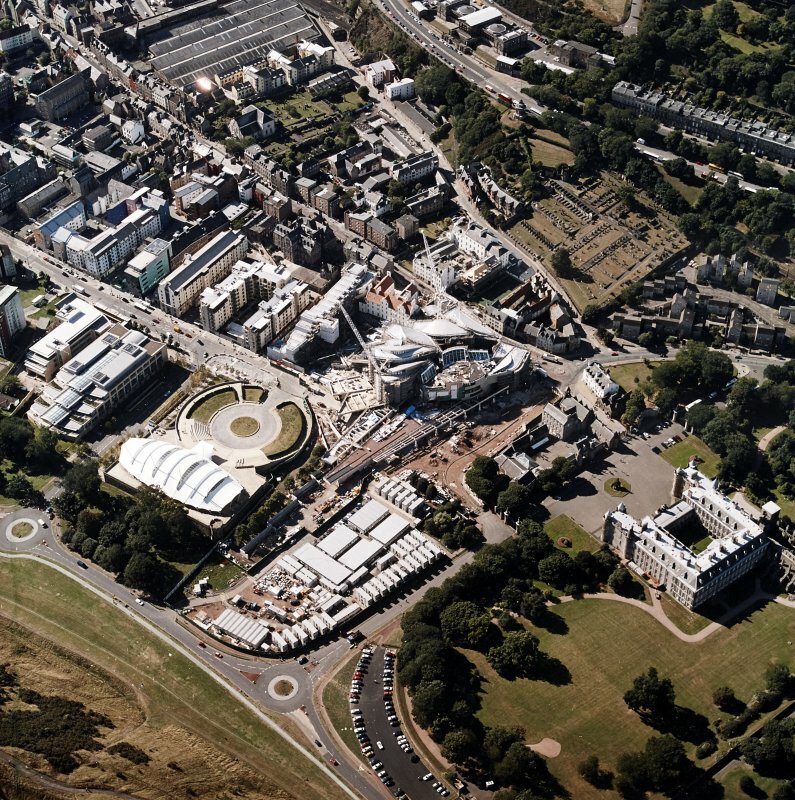 Oblique aerial view centred on the Scottish parliament under construction with 'Our Dynamic Earth' and Holyrood Palace adjacent, taken from the SSW. 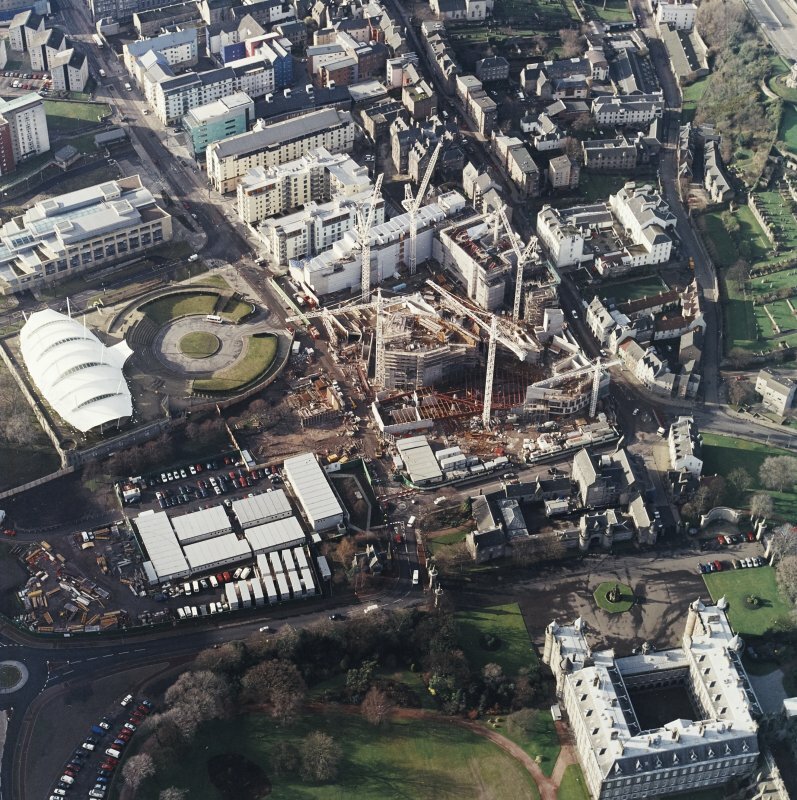 Oblique aerial view centred on the construction of the Scottish Parliament with the exhibition centre and palace adjacent, taken from the NW. 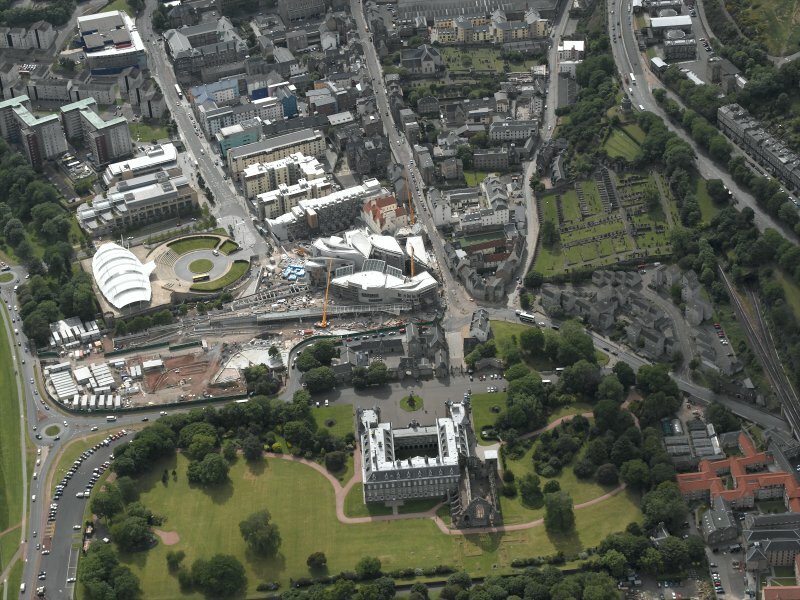 Oblique aerial view centred on the construction of the Scottish Parliament with the exhibition centre and palace adjacent, taken from the NNE. 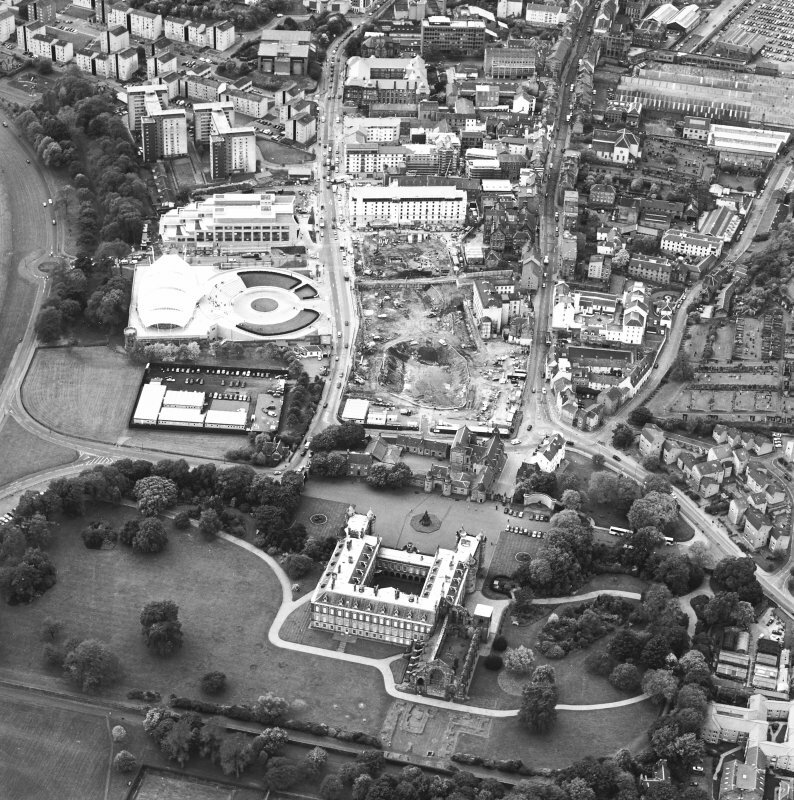 Oblique aerial view centred on the construction of the Scottish Parliament with the exhibition centre and palace adjacent, taken from the SE. 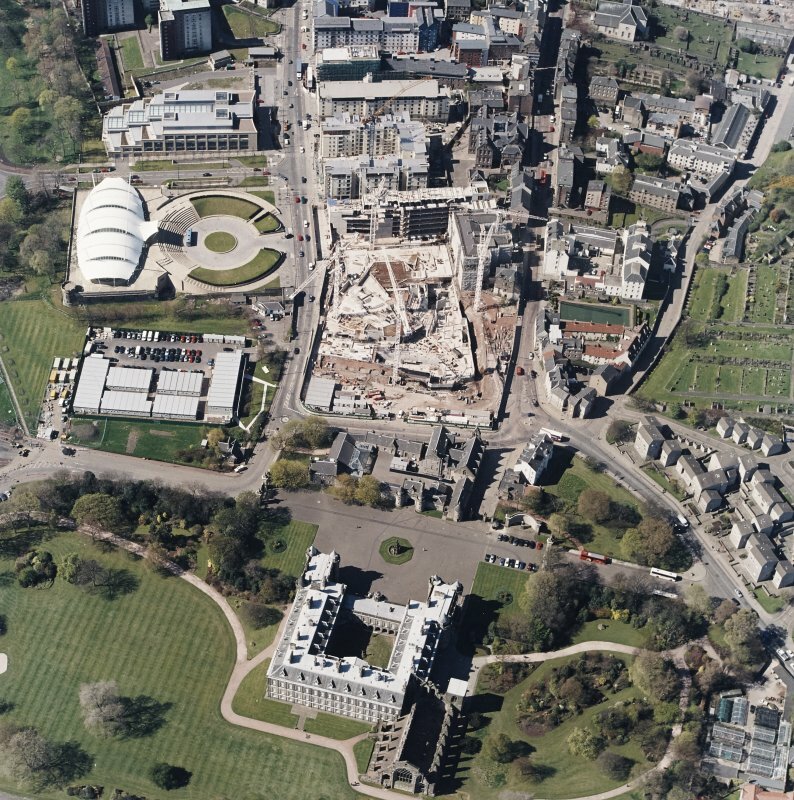 Oblique aerial view centred on the construction of the Scottish Parliament, with `Our Dynamic Earth', Queensberry House and Holyrood Palace adjacent, taken from the SSW. 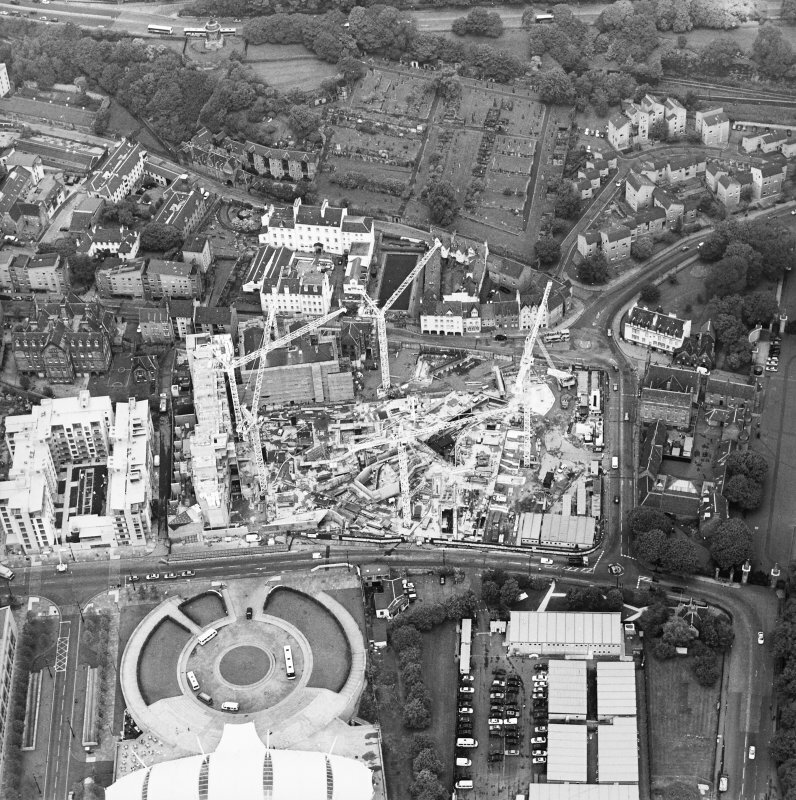 Oblique aerial view centred on the construction of the Scottish Parliament with the exhibition centre adjacent, taken from the SE. 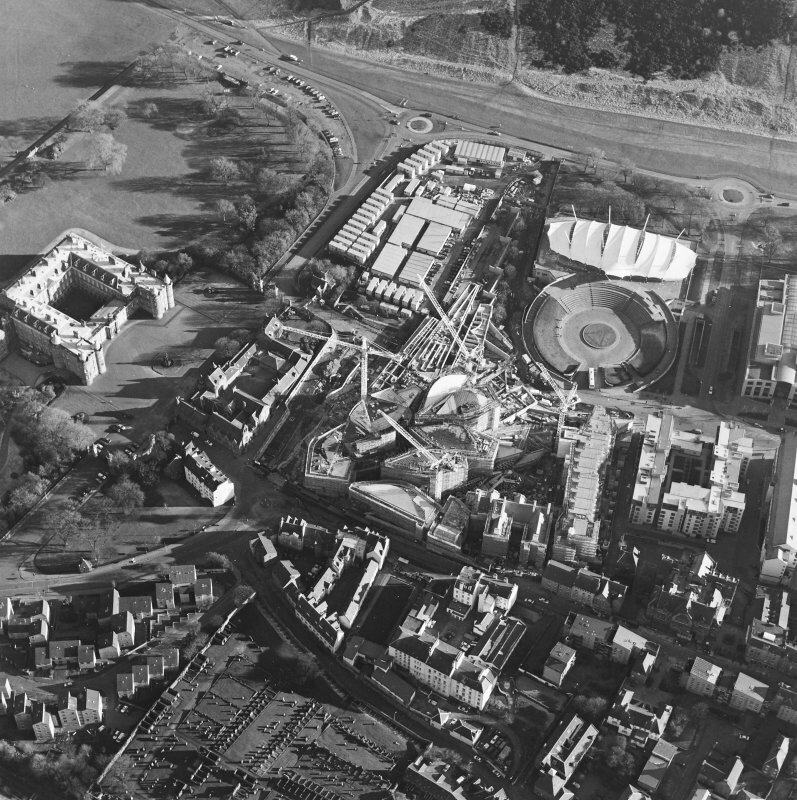 Oblique aerial view centred on the construction of the Scottish Parliament with the exhibition centre and palace adjacent, taken from the WNW. 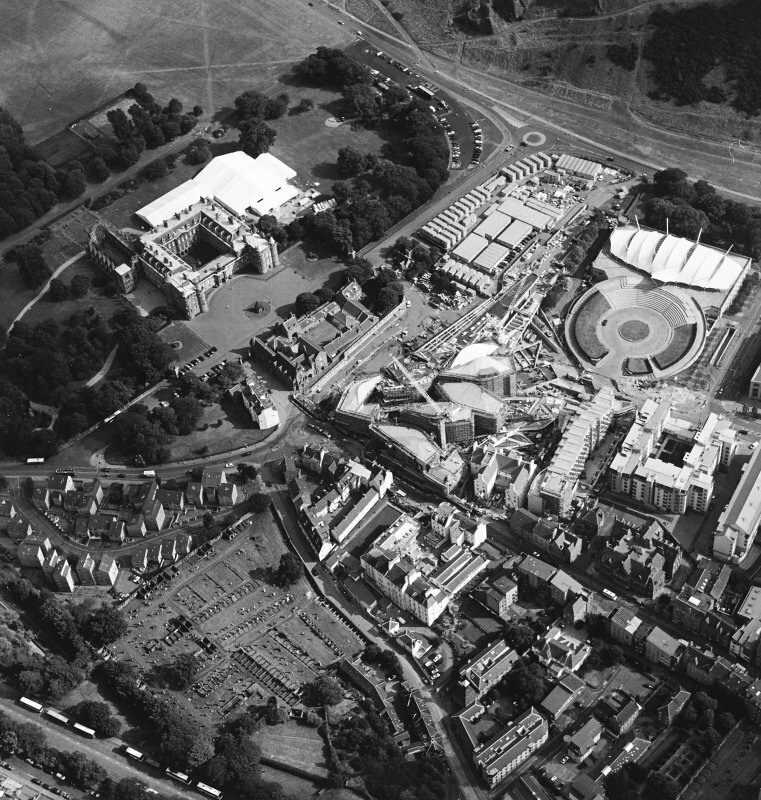 Oblique aerial view centred on the construction of the Scottish Parliament with the exhibition centre and palace adjacent, taken from the NE. 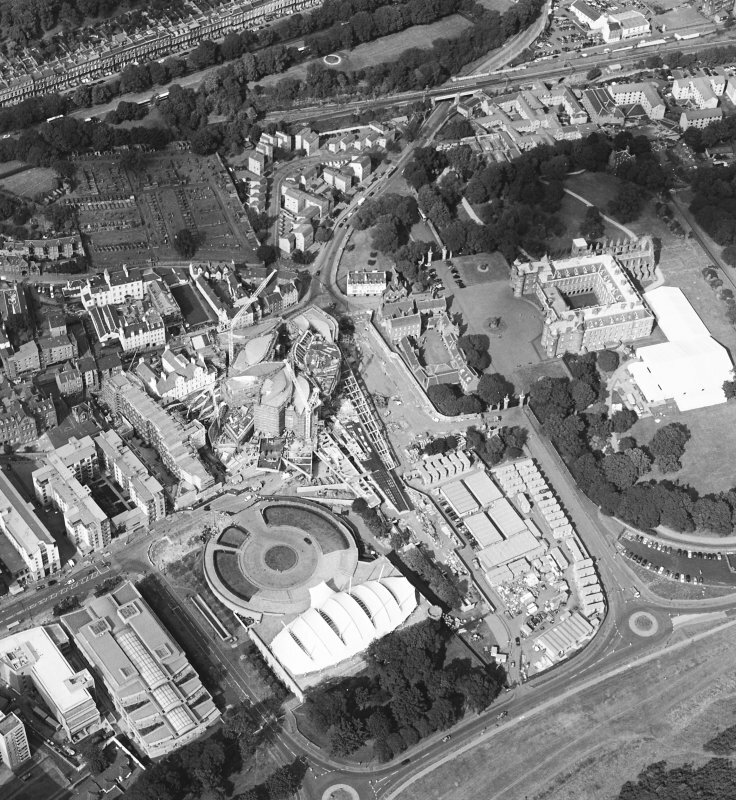 Oblique aerial view centred on the construction of the Scottish Parliament with the exhibition centre and palace adjacent, taken from the WSW. 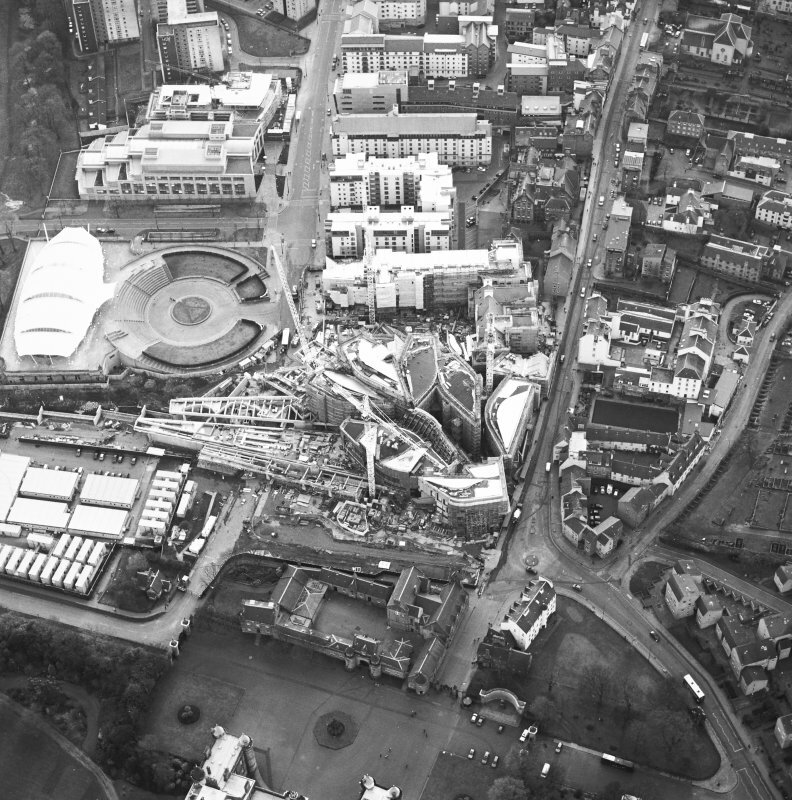 Oblique aerial view centred on the Scottish parliament under construction with 'Our Dynamic Earth' adjacent, taken from the SE. 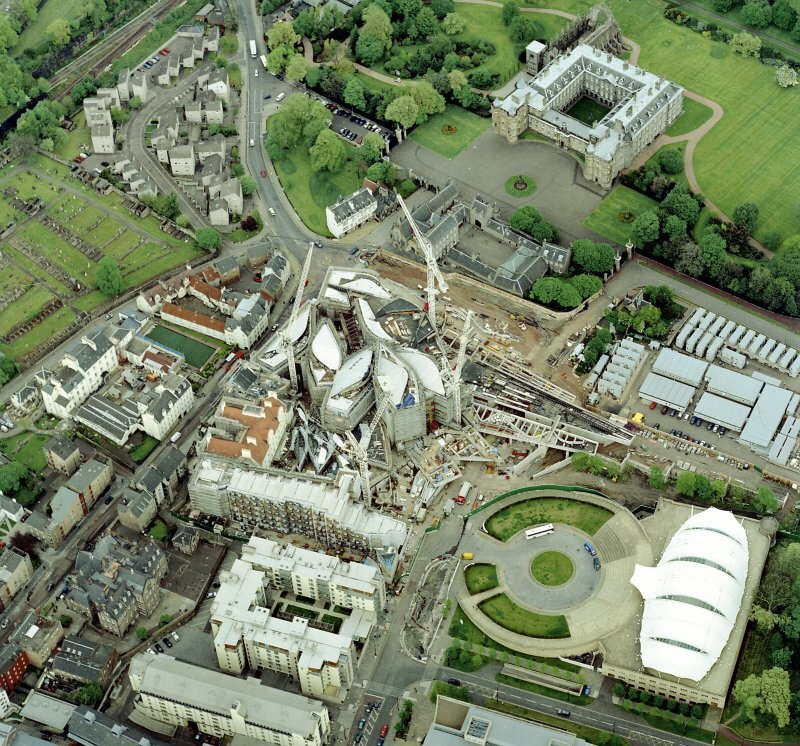 Oblique aerial view centred on the construction of the Scottish Parliament with Our Dynamic Earth, Queensbury House and Holyrood Palace adjacent, taken from the W.
Oblique aerial view centred on the construction of the Scottish Parliament with the exhibition centre and palace adjacent, taken from the ENE. 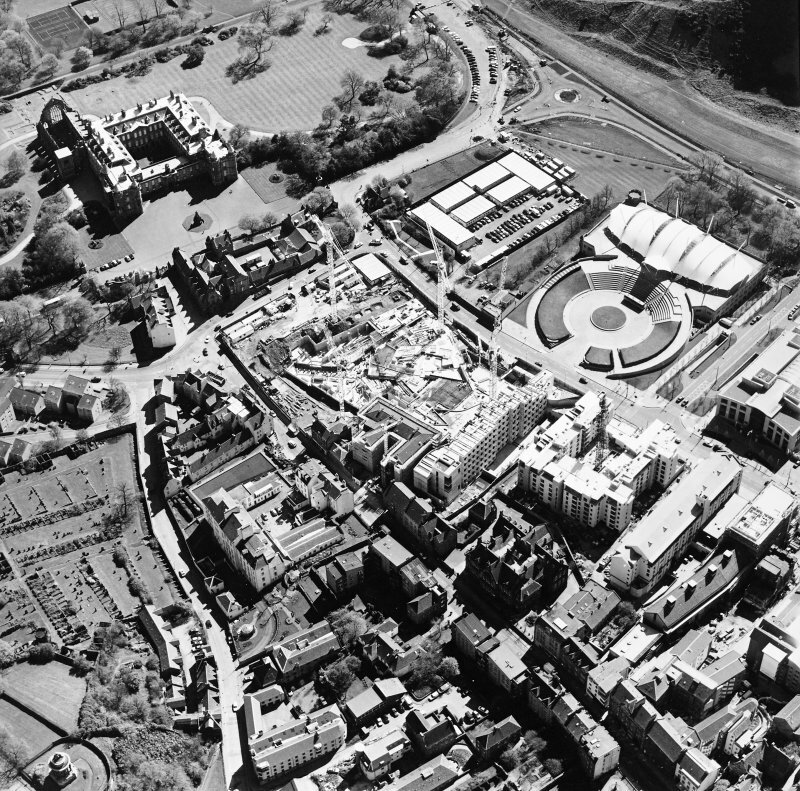 Oblique aerial view centred on the construction of the Scottish Parliament with the exhibition centre and palace adjacent, taken from the SW.
Oblique aerial view centred on the construction of the Scottish Parliament with exhibition centre adjacent, taken from the NE. 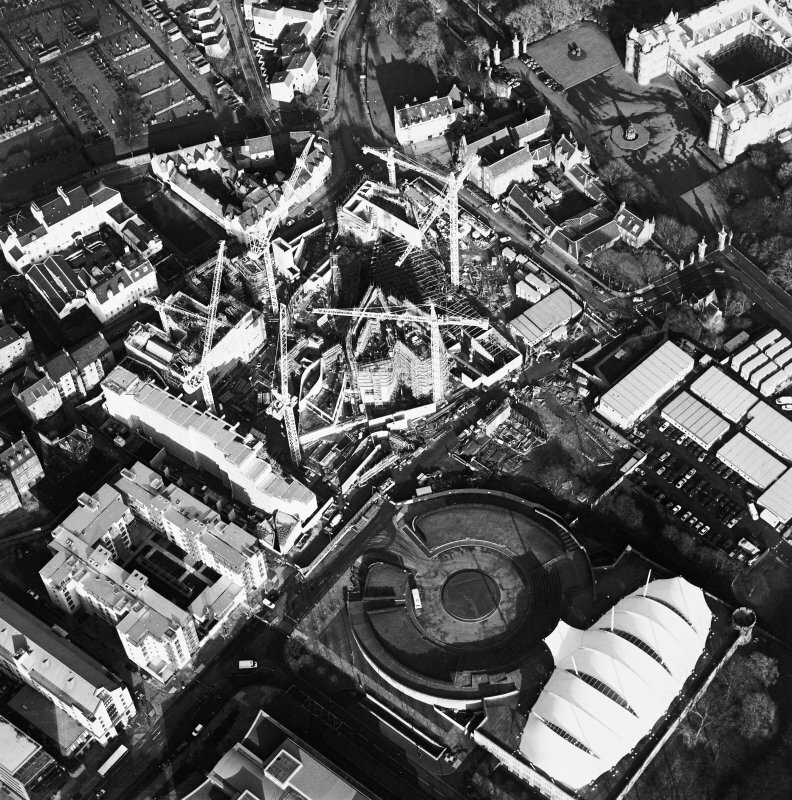 Oblique aerial view centred on the construction of the Scottish parliament, taken from the SW.
Oblique aerial view centred on the construction of the Scottish parliament, taken from the W.
Oblique aerial view centred on the Scottish parliament under construction, taken from the SW.
Oblique aerial view of Edinburgh centred on the construction of the Scottish Parliament with the 'Our Dynamic Earth' building adjacent, taken from the S.
Oblique aerial view centred on the construction of the Scottish Parliament, with `Our Dynamic Earth¿, Queensberry House and Holyrood Palace adjacent, taken from the SW.
Oblique aerial view centred on the Scottish parliament under construction with 'Our Dynamic Earth' adjacent, taken from the SSE. 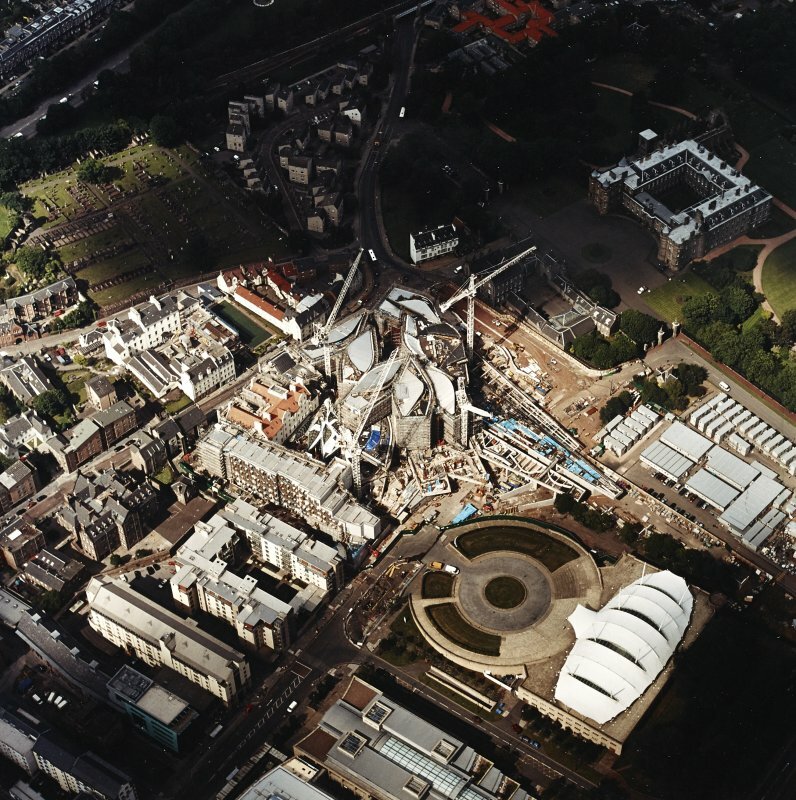 Oblique aerial view centred on the Scottish parliament under construction with 'Our Dynamic Earth' and Holyrood palace adjacent, taken from the WSW. 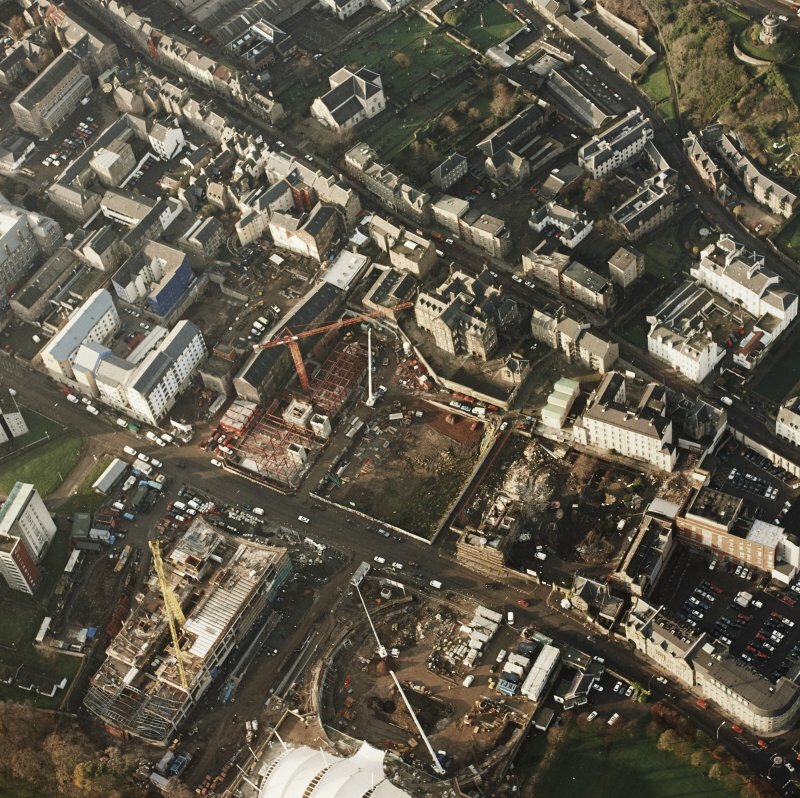 Oblique aerial view centred on the Scottish Parliament under construction, taken from the SSW. 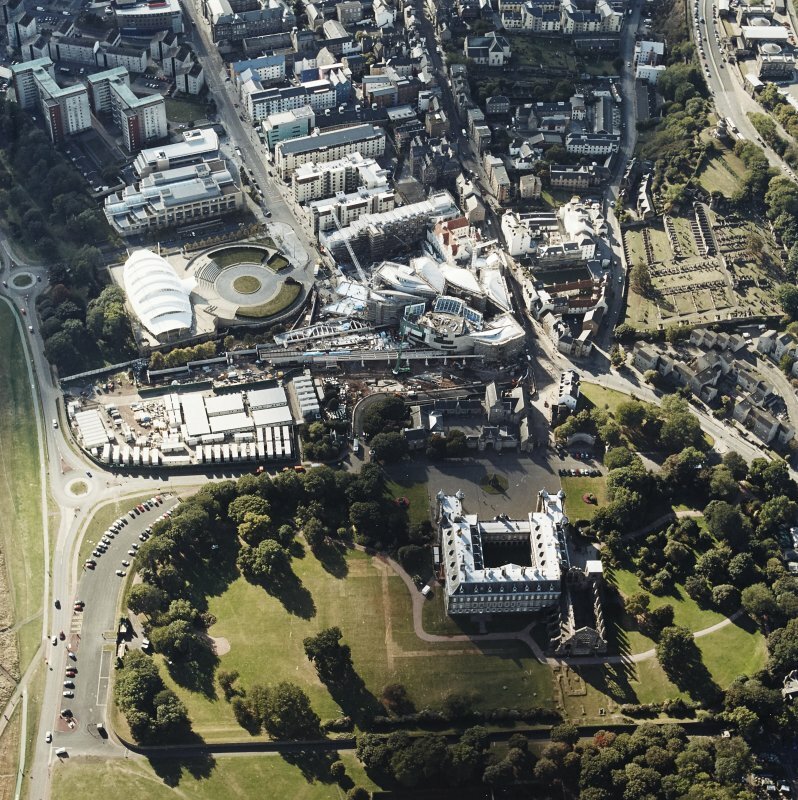 Oblique aerial view centred on the Scottish Parliament under construction with `Our Dynamic Earth¿ and the palace adjacent, taken from the S.
Oblique aerial view centred on the Scottish Parliament under construction with `Our Dynamic Earth¿ and the palace adjacent, taken from the NW. 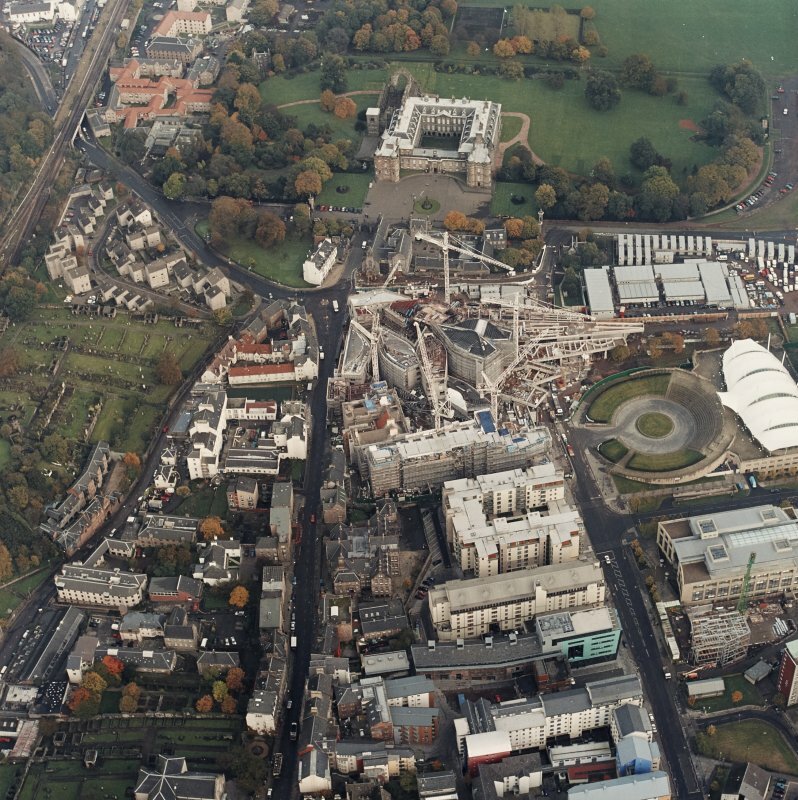 Oblique aerial view centred on the construction of the Scottish Parliament with `Our Dynamic Earth¿ and Holyrood Palace adjacent, taken from the NW. 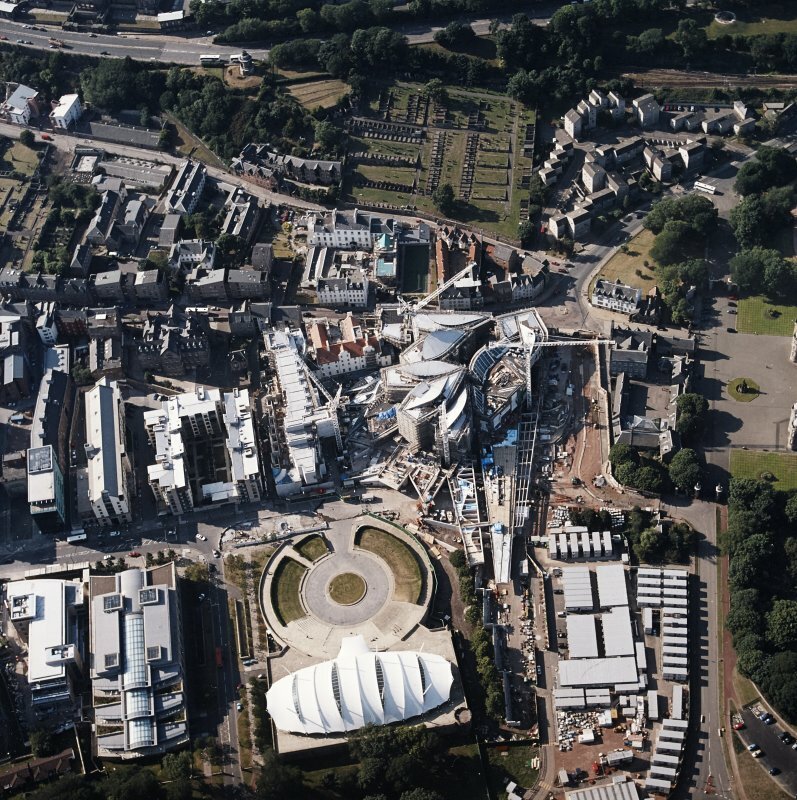 Oblique aerial view centred on the construction of the Scottish Parliament with the exhibition centre adjacent, taken from the SSE. 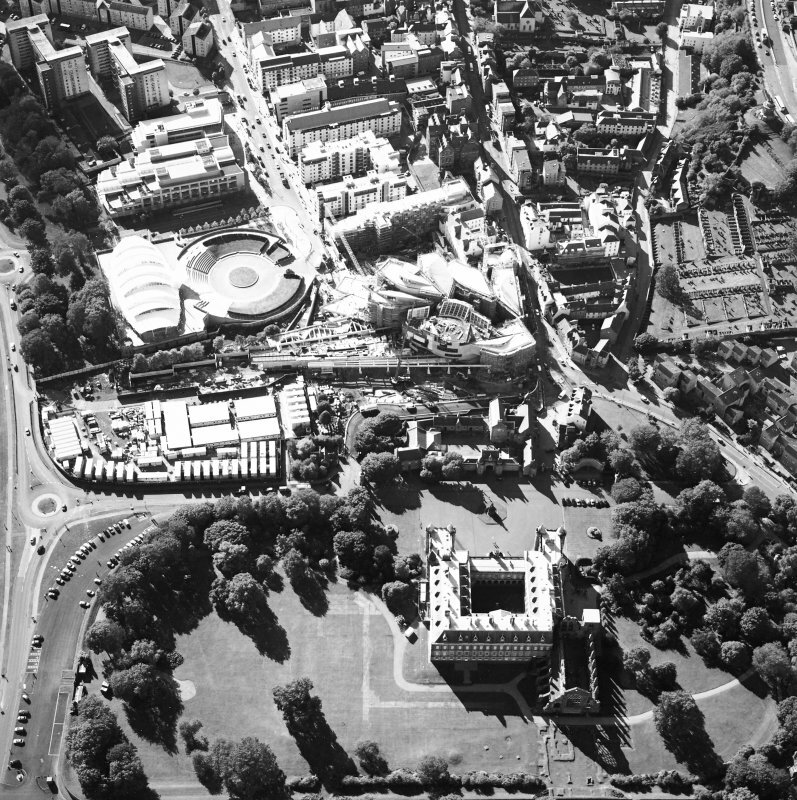 Oblique aerial view centred on the construction of the Scottish Parliament with exhibition centre and palace adjacent, taken from the SW.
Oblique aerial view centred on the construction of the Scottish parliament, taken from the SE. 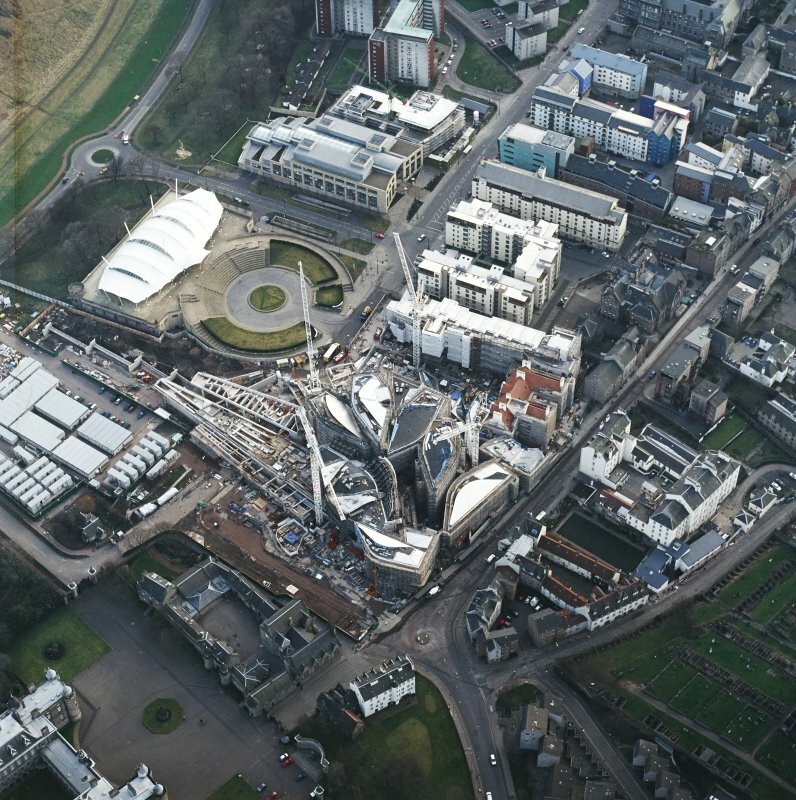 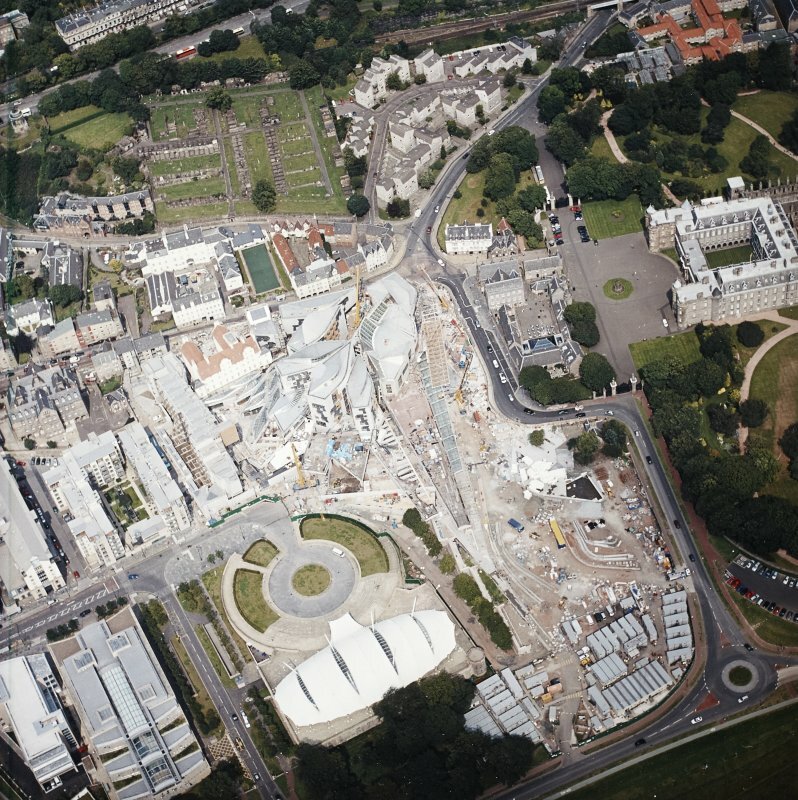 Oblique aerial view centred on the Scottish Parliament under construction with `Our Dynamic Earth¿ adjacent, taken from the WSW. 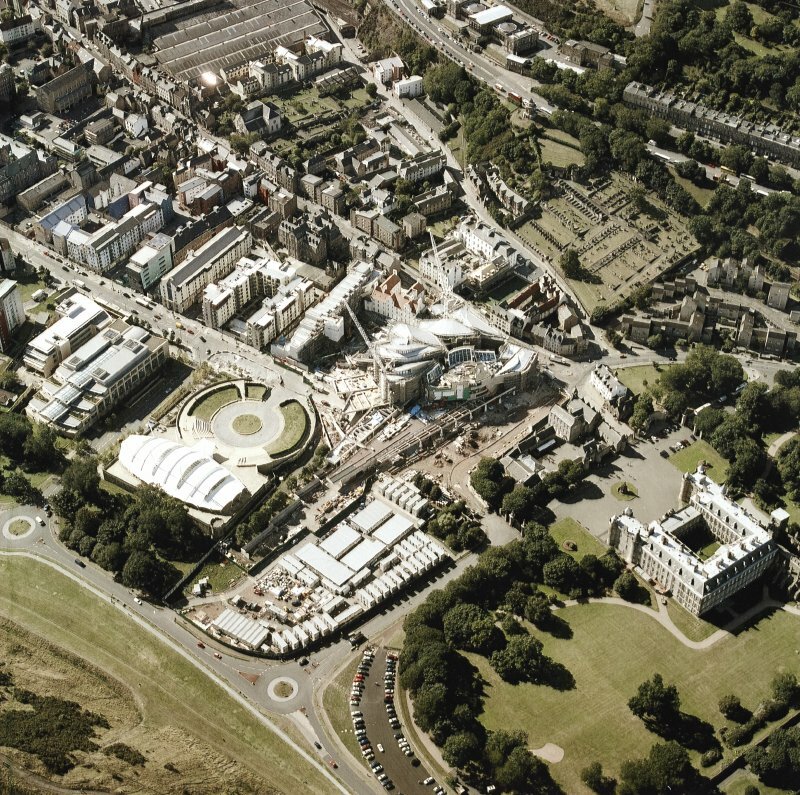 Oblique aerial view centred on the Scottish Parliament under construction with `Our Dynamic Earth¿ and palace adjacent, taken from the W.
Oblique aerial view centred on the Scottish parliament under construction with `Our Dynamic Earth' adjacent, taken from the SE. 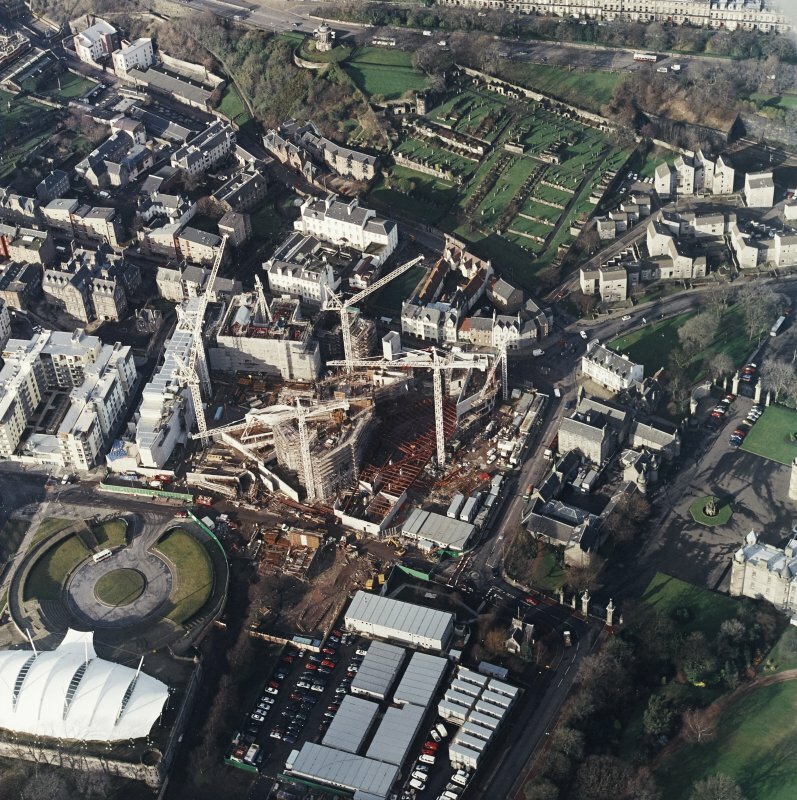 Oblique aerial view centred on the Scottish parliament under construction with `Our Dynamic Earth¿ adjacent, taken from the WNW. 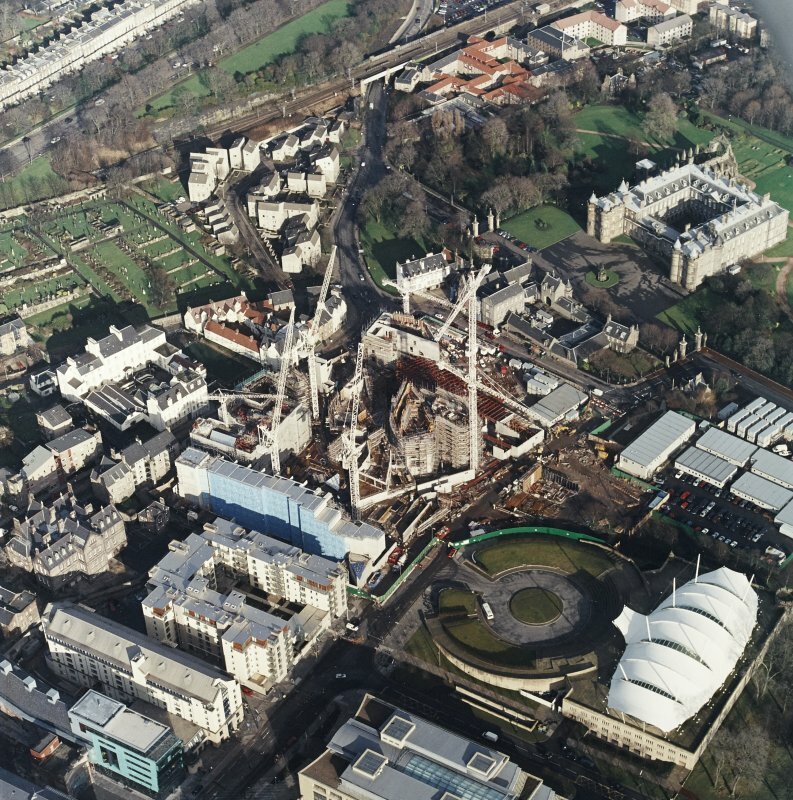 Oblique aerial view centred on the Scottish parliament under construction with `Our Dynamic Earth¿ and Holyrood Palace adjacent, taken from the NE. 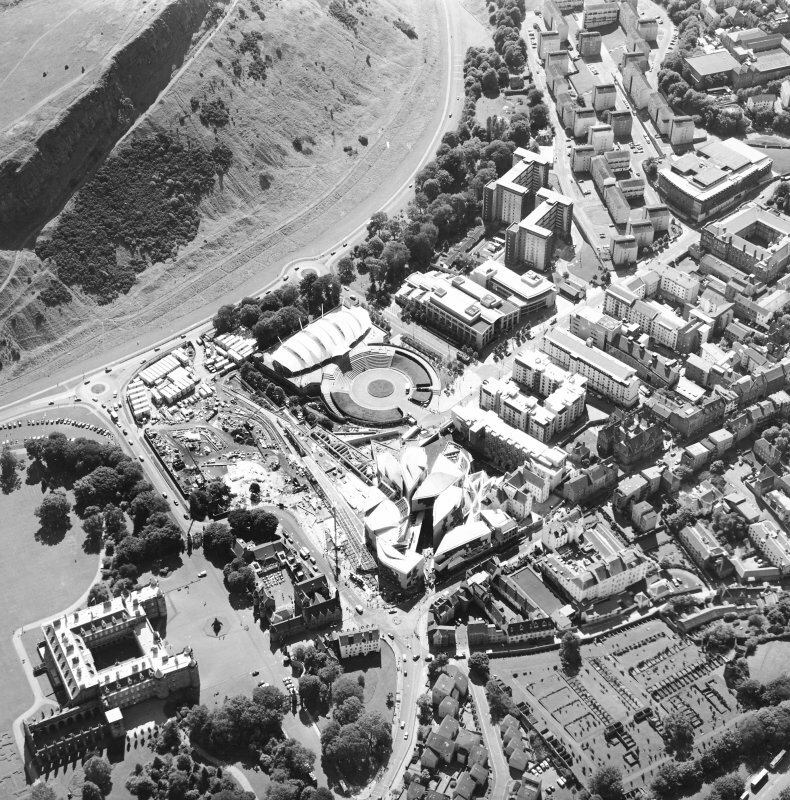 Oblique aerial view of Edinburgh centred on the construction of the Scottish Parliament with the 'Our Dynamic Earth' building and Holyrood Palace adjacent, taken from the WNW. 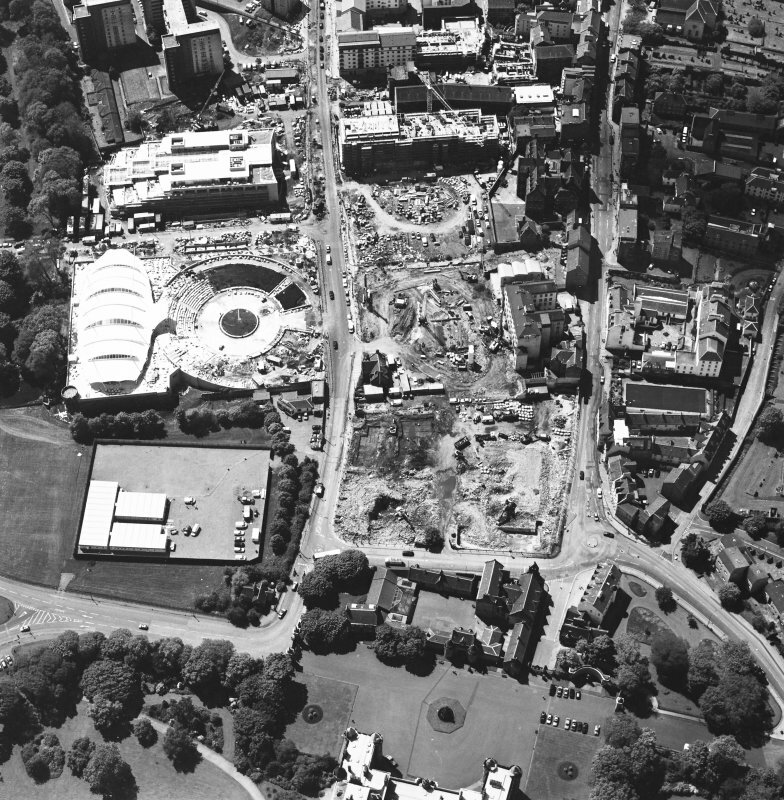 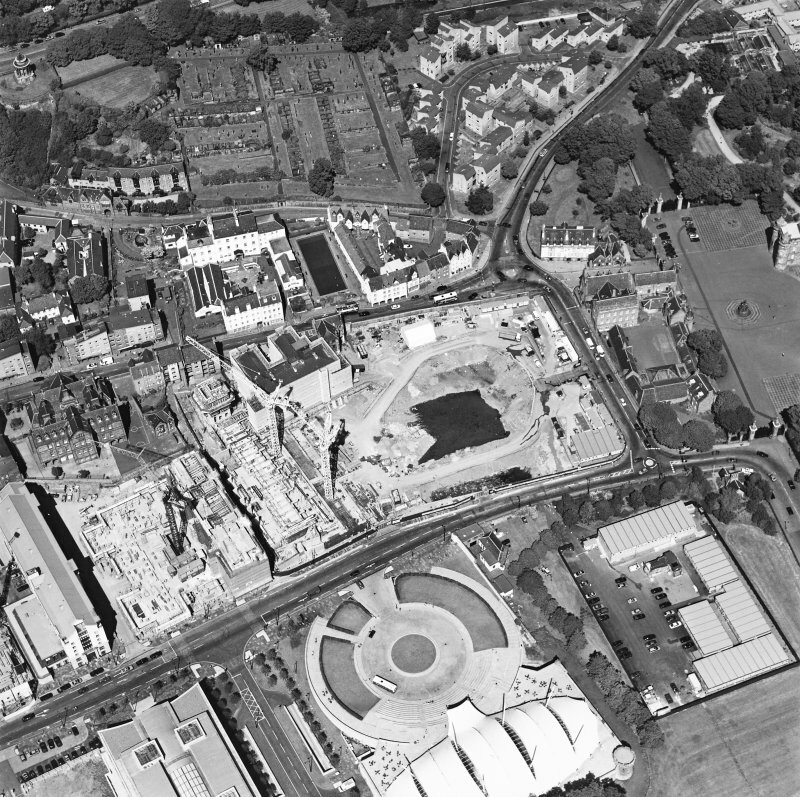 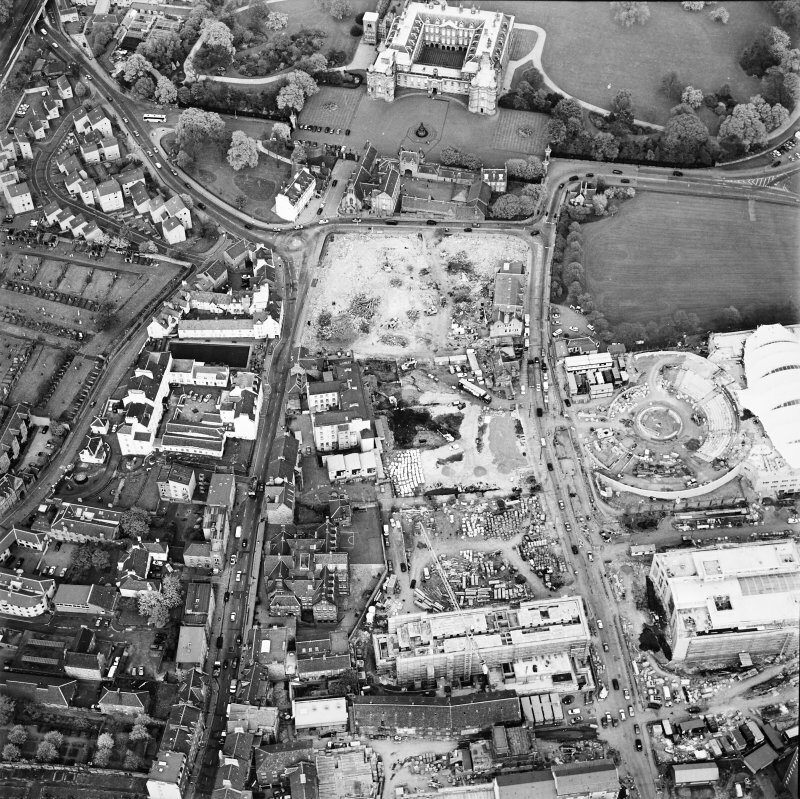 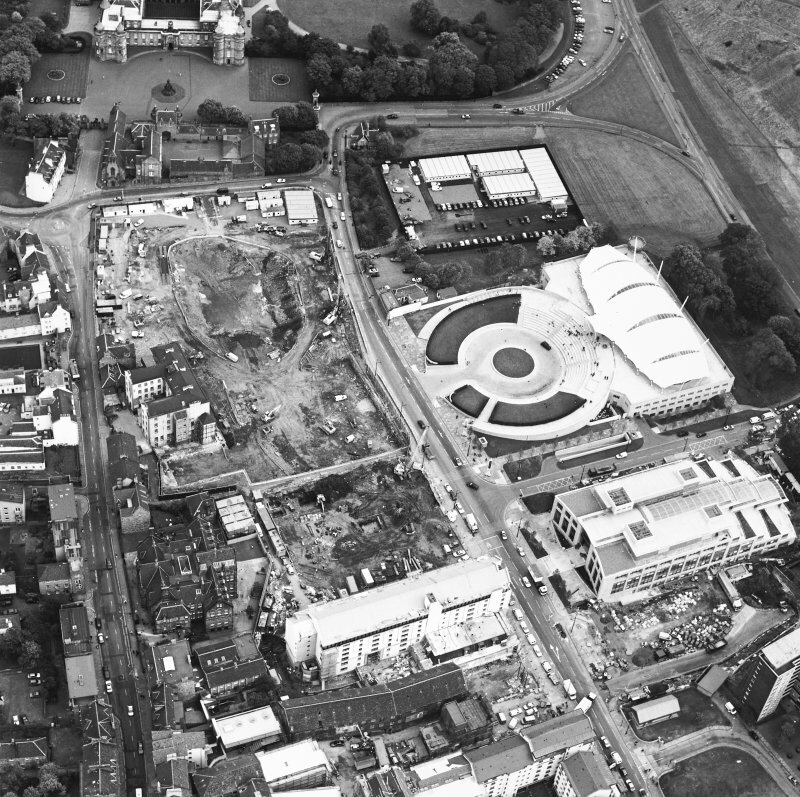 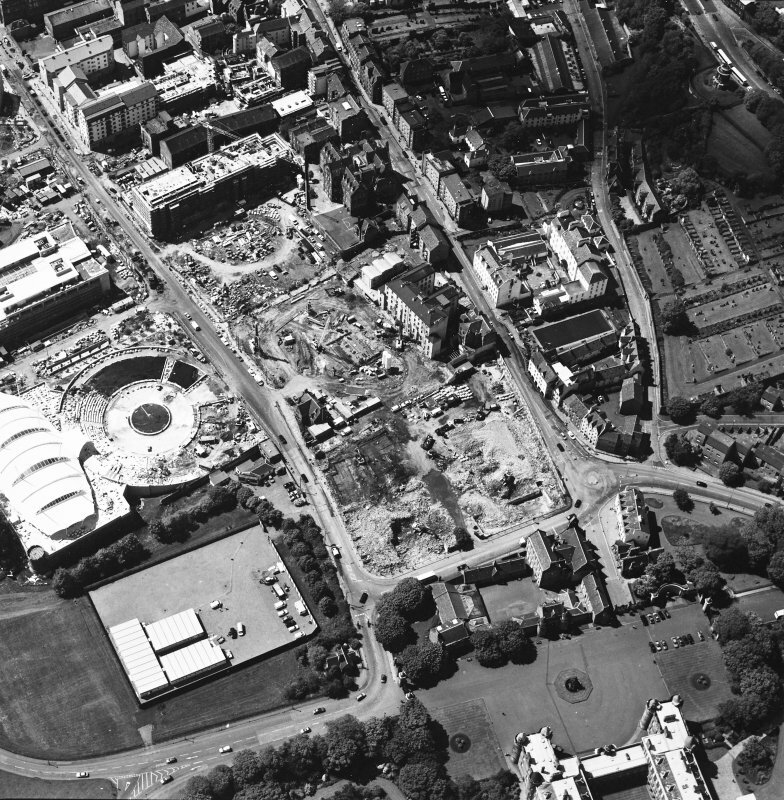 Oblique aerial view centred on the construction site, with exhibition centre and Queensbury House adjacent, taken from the E.
Oblique aerial view centred on the construction site, with exhibition centre and Queensbury House adjacent, taken from the SE. 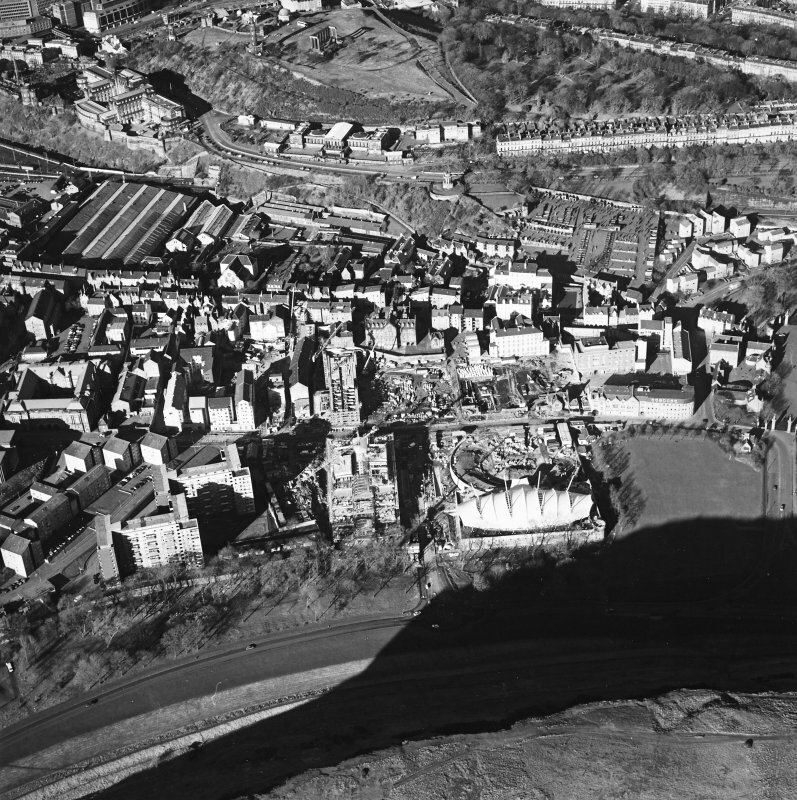 Oblique aerial view of Edinburgh centred on the construction of the Scottish Parliament with the 'Our Dynamic Earth' building adjacent, taken from the ENE. 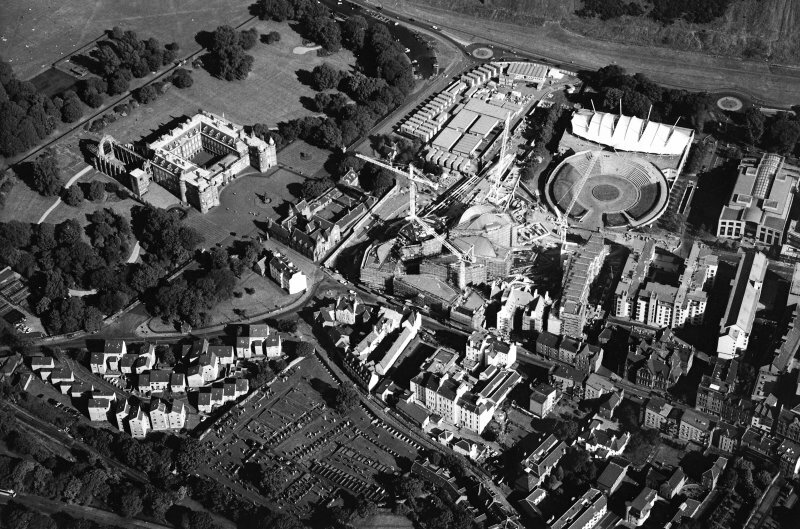 Oblique aerial view of Edinburgh centred on the construction of the Scottish Parliament with Holyrood Palace adjacent, taken from the WSW. 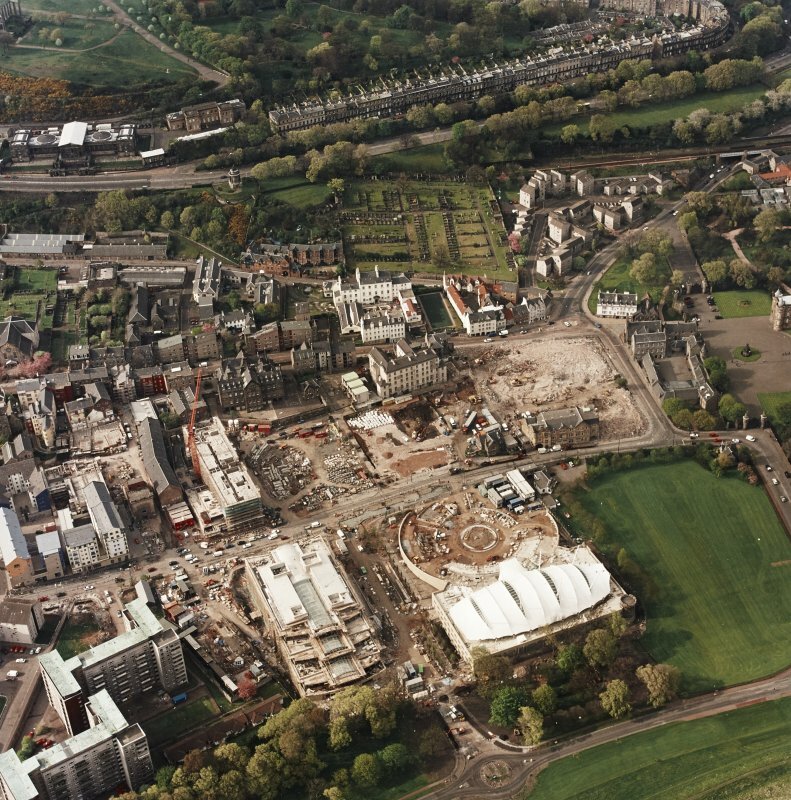 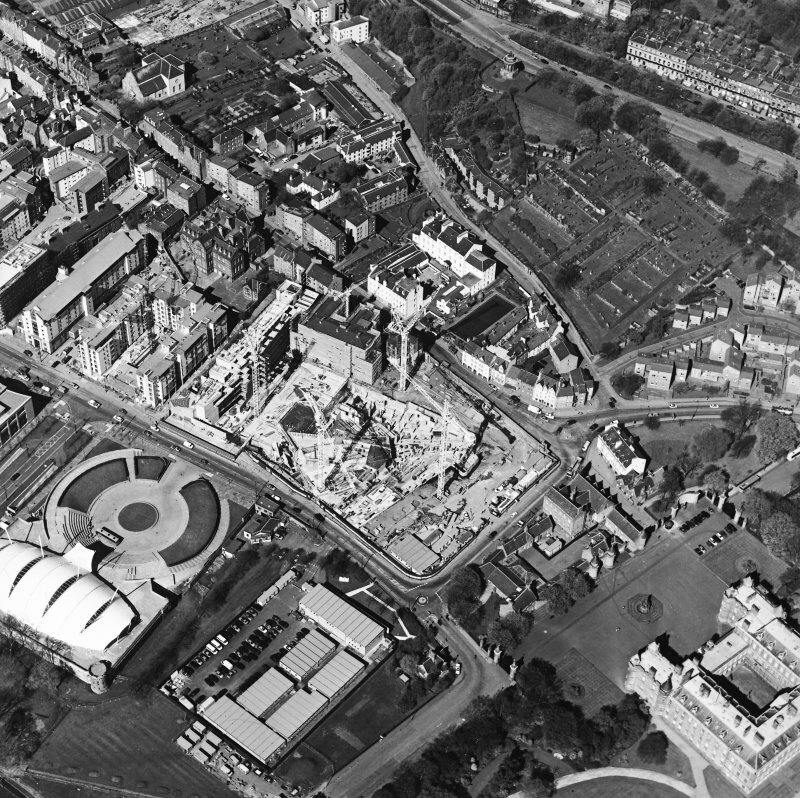 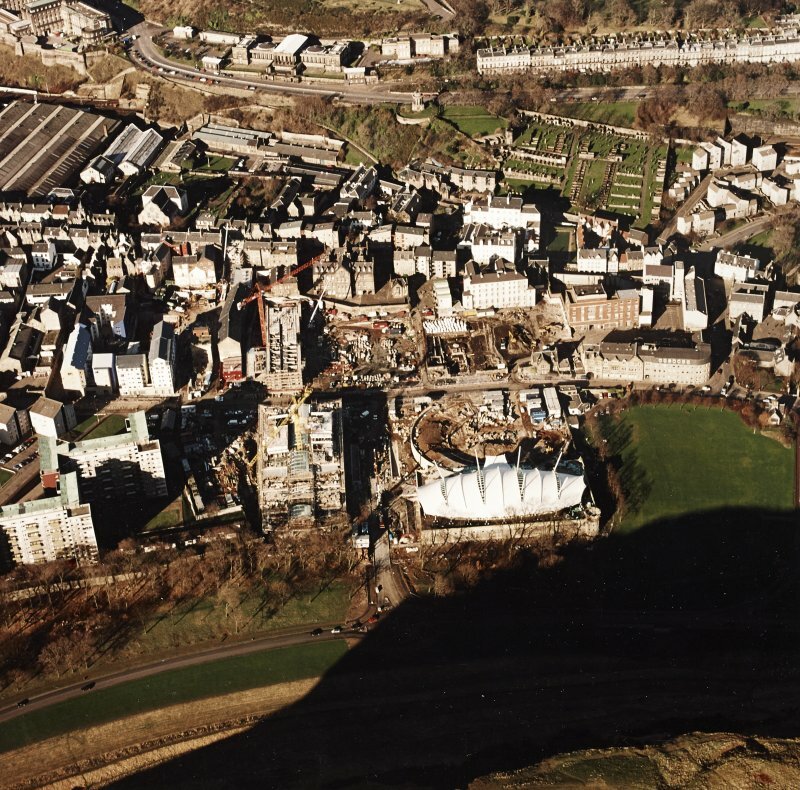 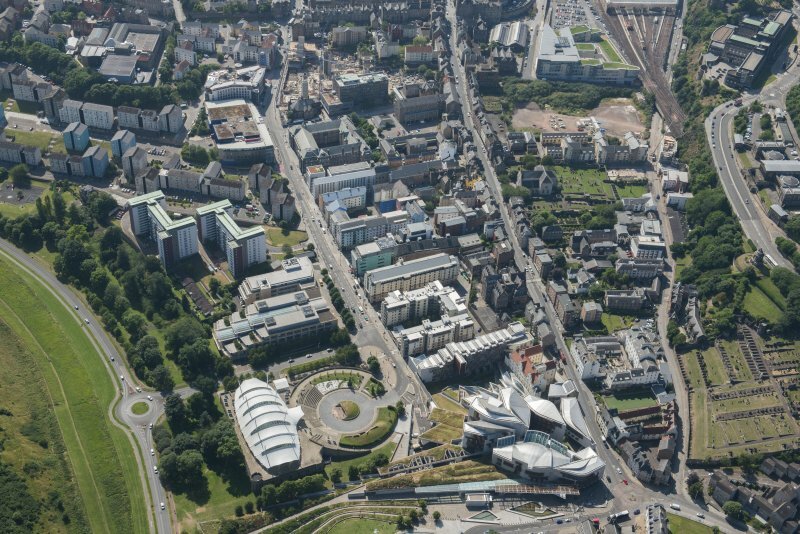 Oblique aerial view of Edinburgh centred on the Scottish Parliament and 'Our Dynamic Earth' under construction and the Canongate, taken from the WNW. 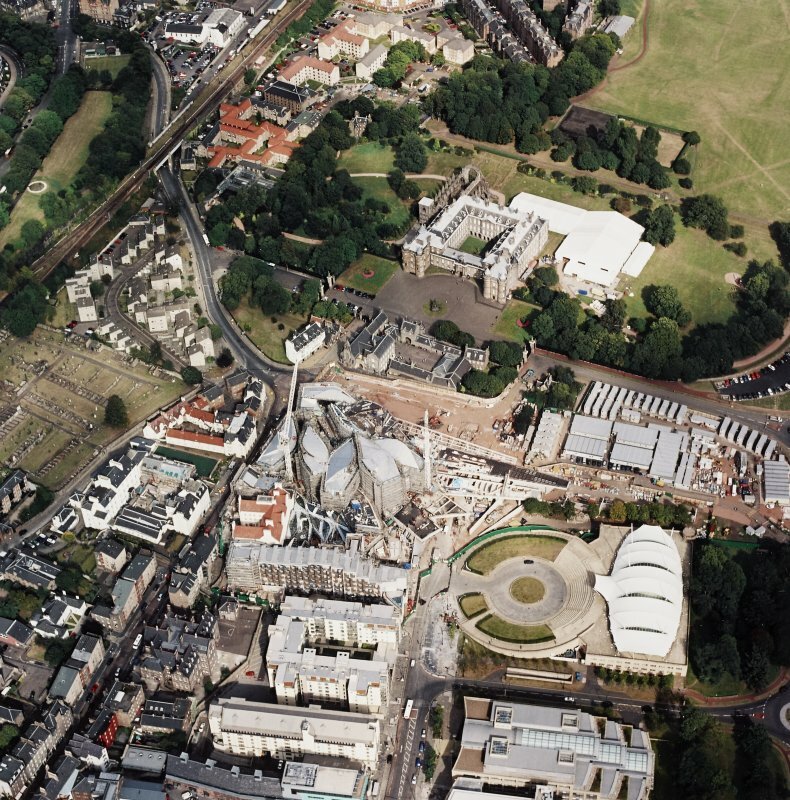 Oblique aerial view centred on the Scottish parliament building with `Our Dynamic Earth¿ and Holyrood palace adjacent, taken from the N.
Oblique aerial view centred on the construction of the Scottish Parliament with the exhibition centre and palace adjacent, taken from the E.
Oblique aerial view centred on the construction of the Scottish Parliament with the exhibition centre and palace adjacent, taken from the ESE. 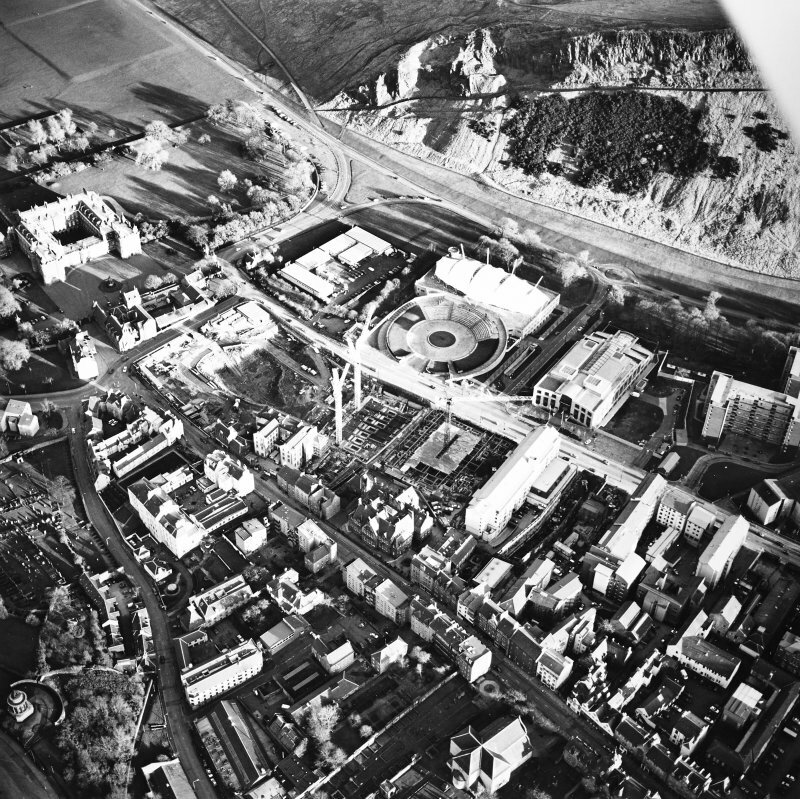 Oblique aerial view centred on the construction of the Scottish Parliament with exhibition centre adjacent, taken from the SE. 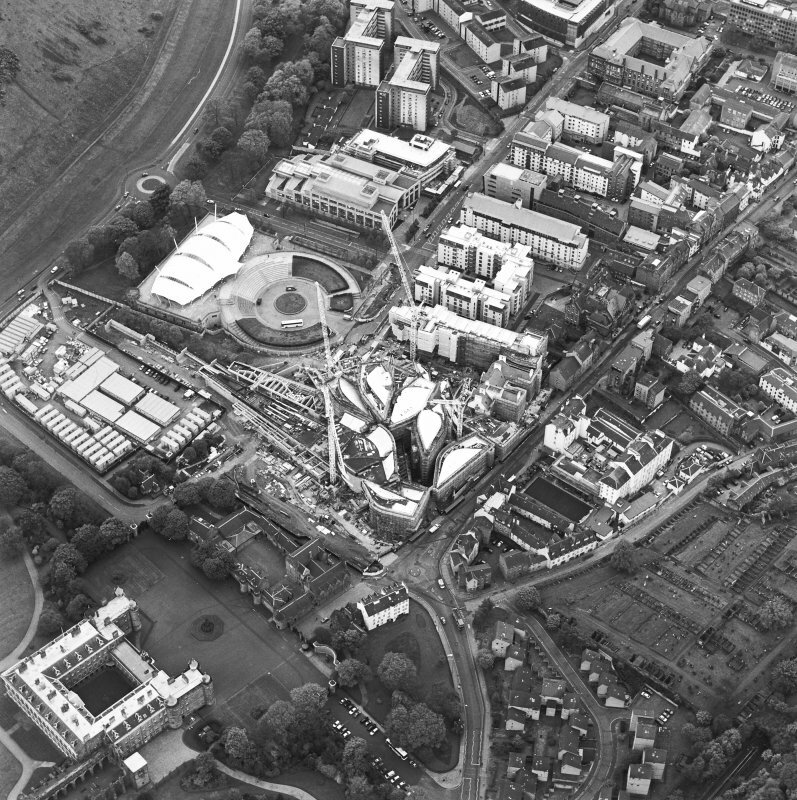 Oblique aerial view centred on the construction of the Scottish Parliament with exhibition centre adjacent, taken from the NNW. 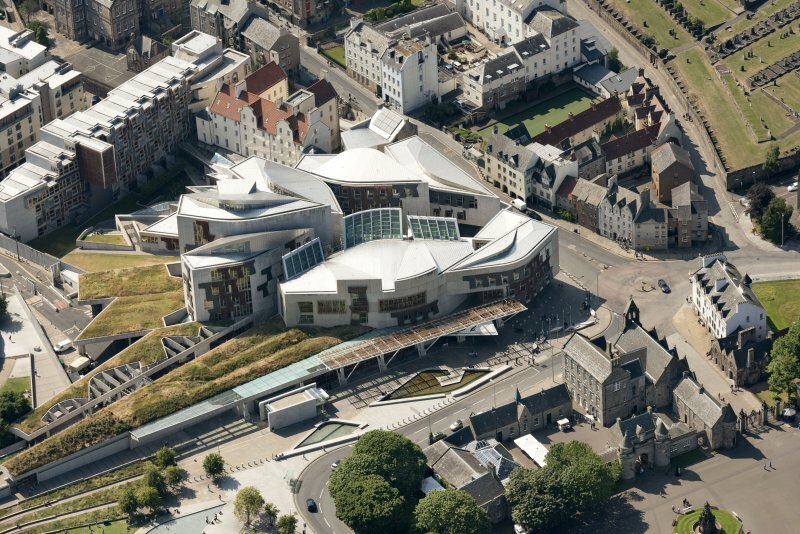 Oblique aerial view of the Scottish Parliament, looking WNW. 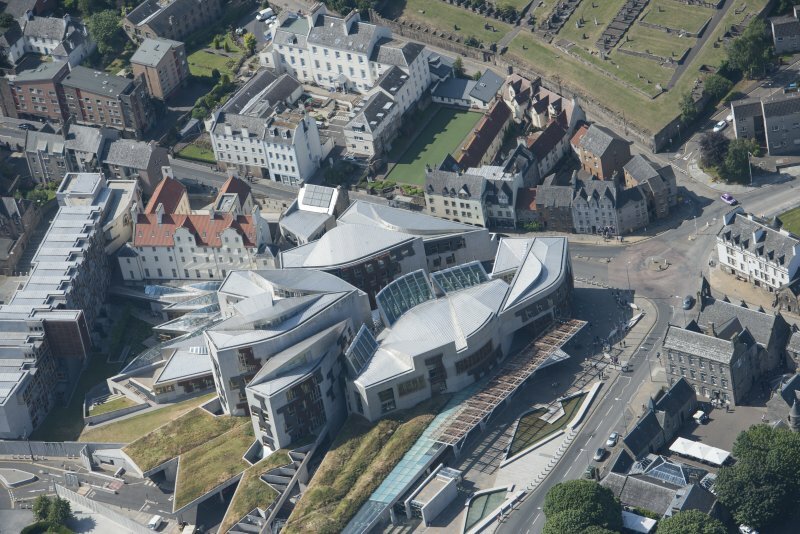 Oblique aerial view of the Scottish Parliament, looking NW. 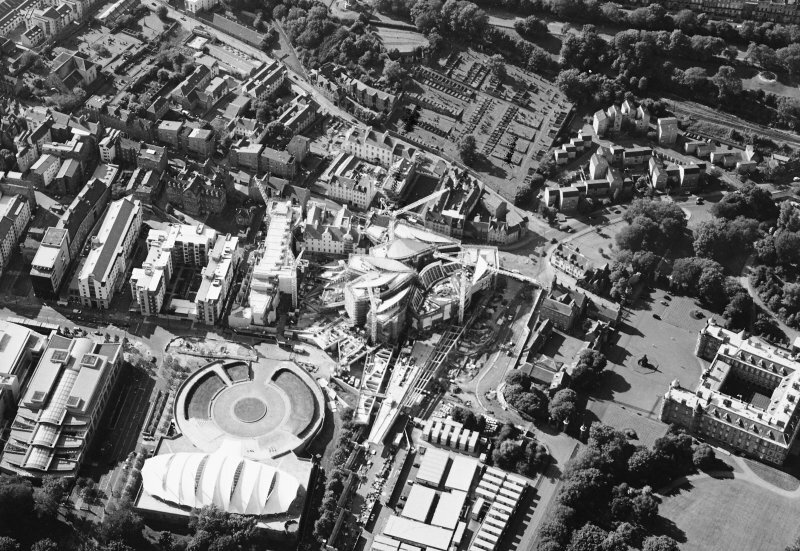 Oblique aerial view of the Canongate and Scottish Parliament, looking WSW. 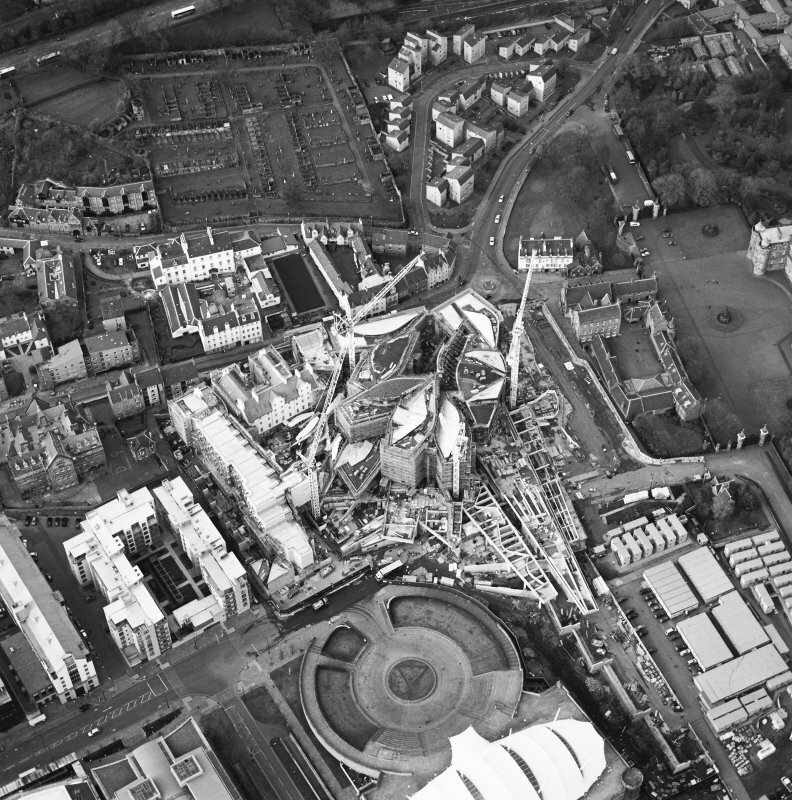 Detailed view of 'Travelling the Distance', Scottish Parliament, Edinburgh. 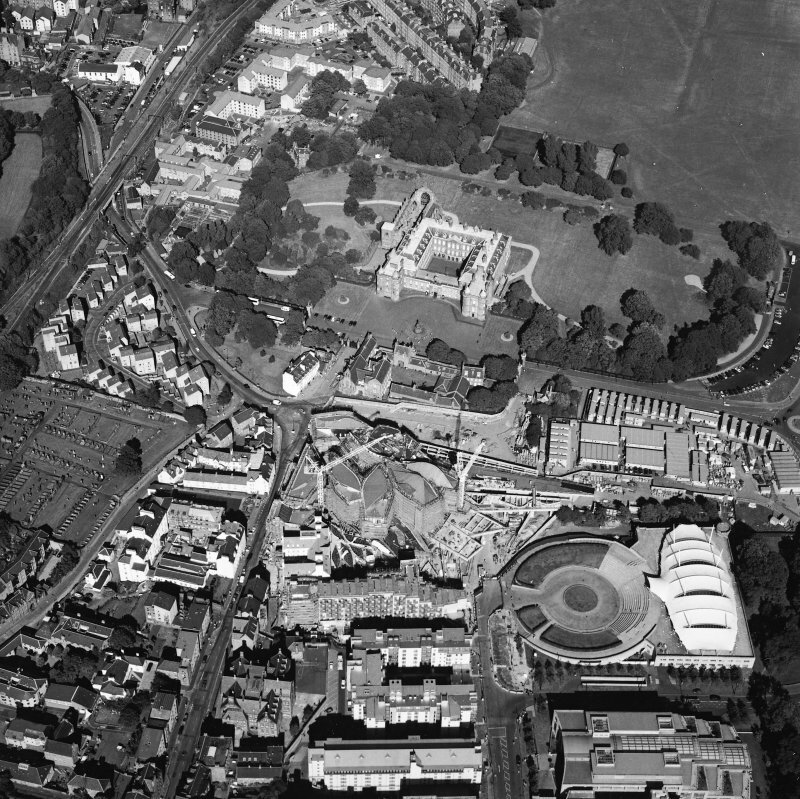 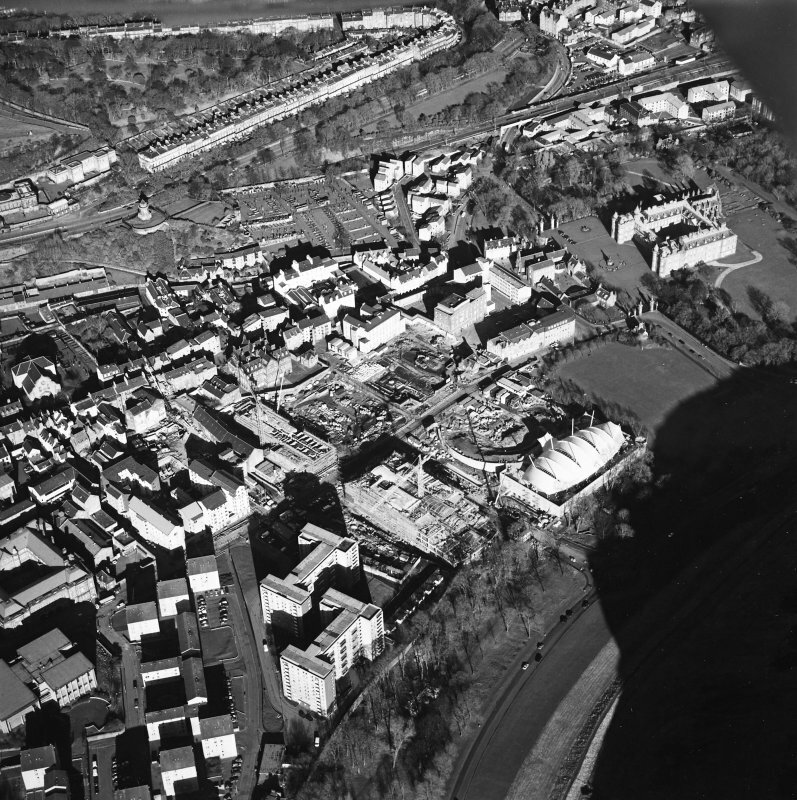 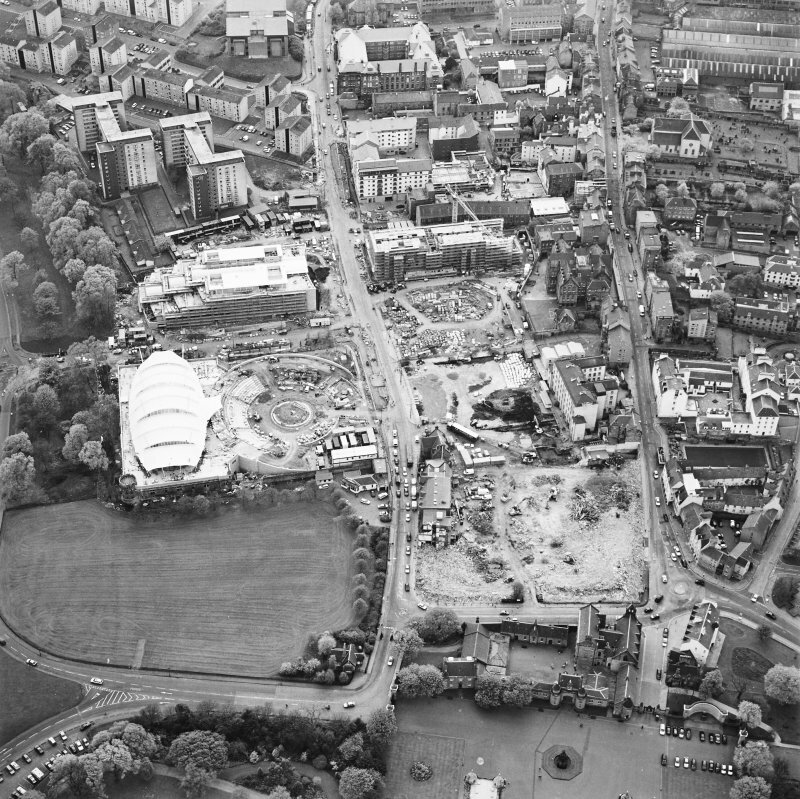 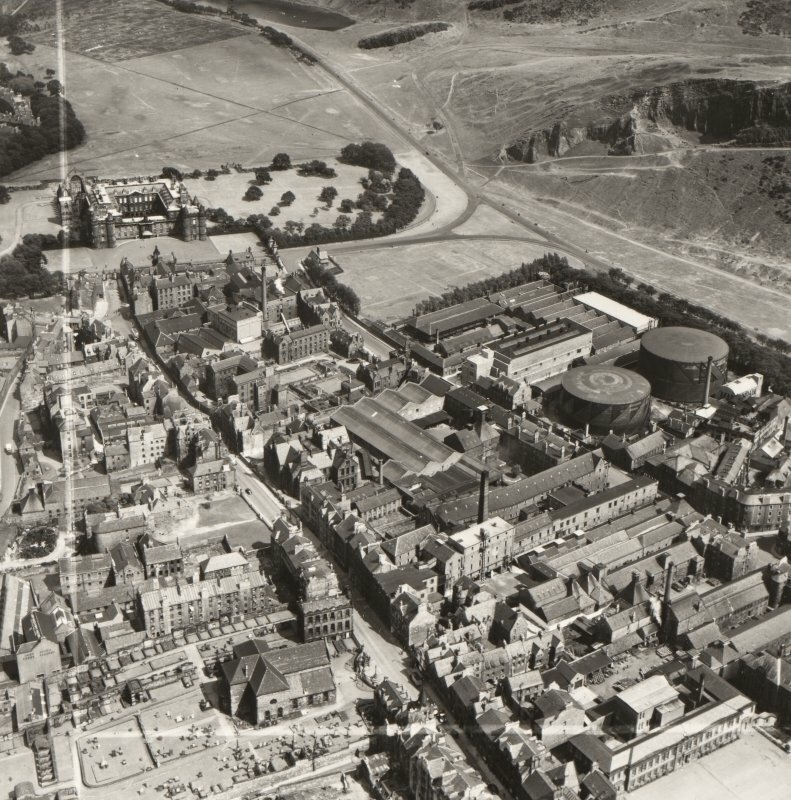 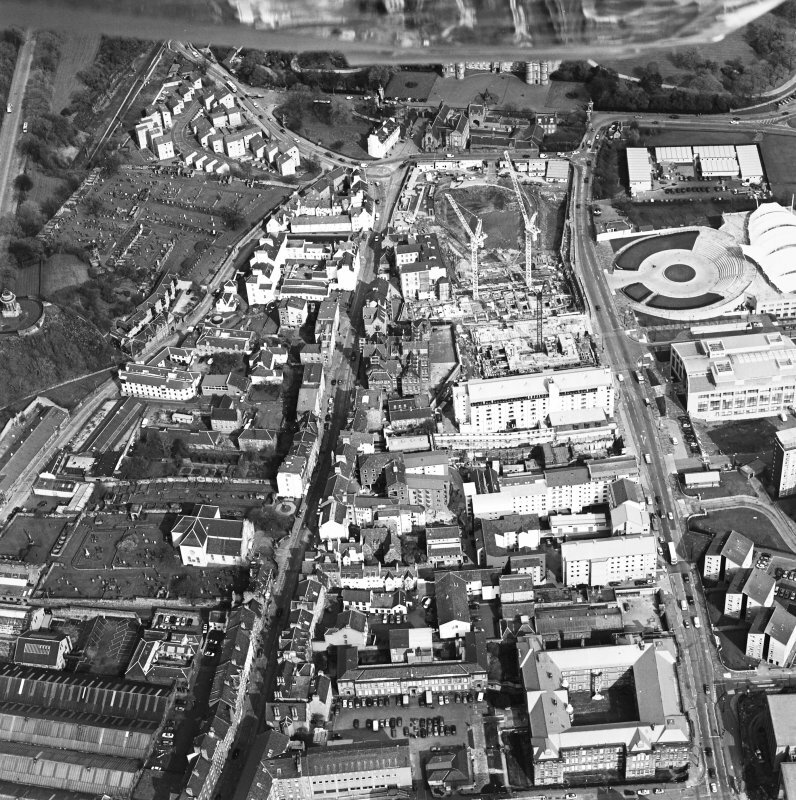 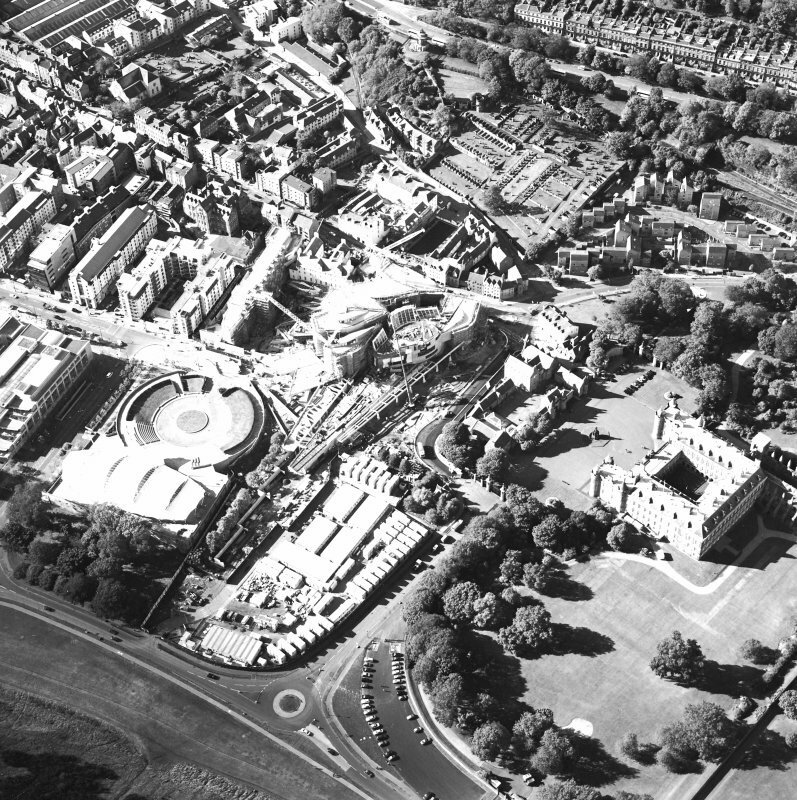 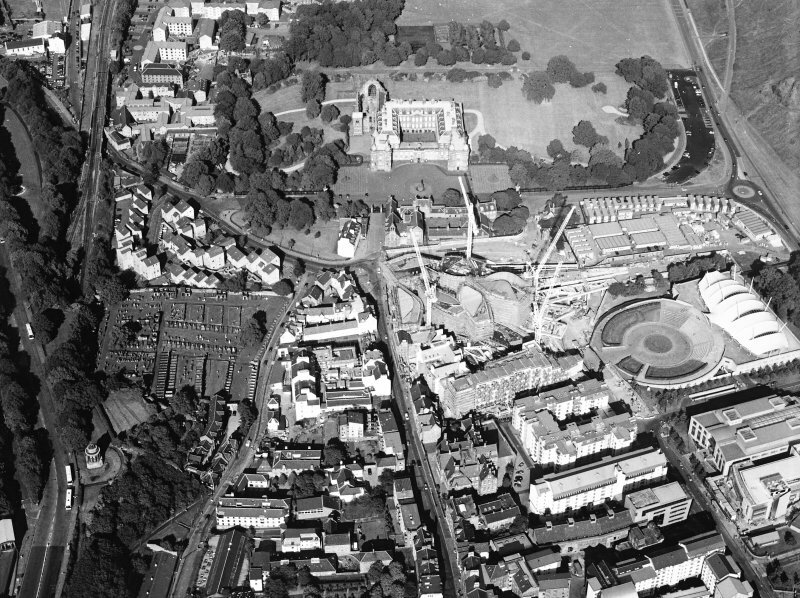 Oblique aerial view of the Canongate area, Edinburgh, c1951 including Holyrood Palace, the Meadow Flat Gas Holders (now the site of Dynamic Earth) and Holyrood Brewery (now the site of the Scottish Parliament). 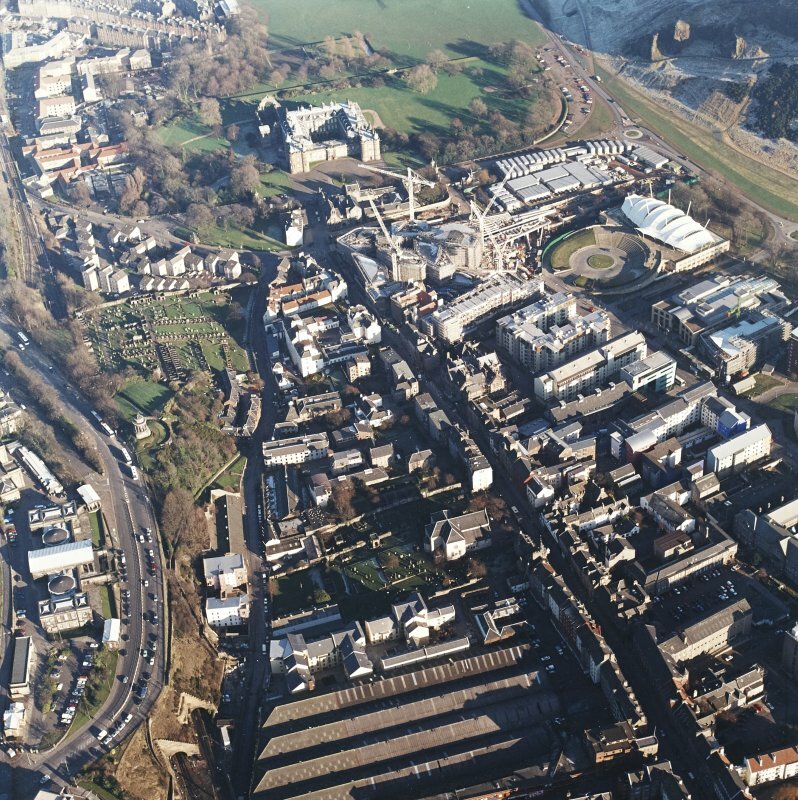 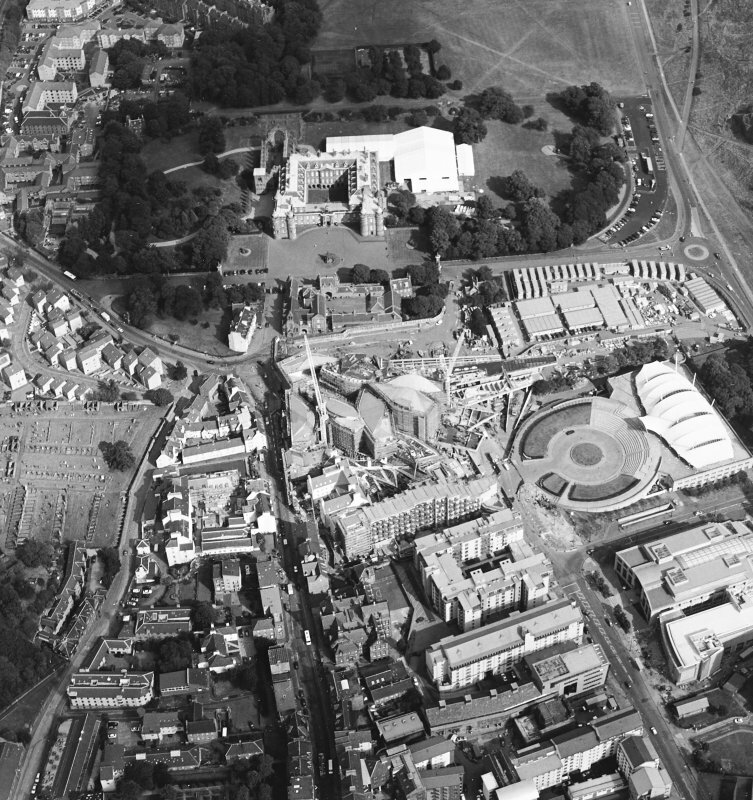 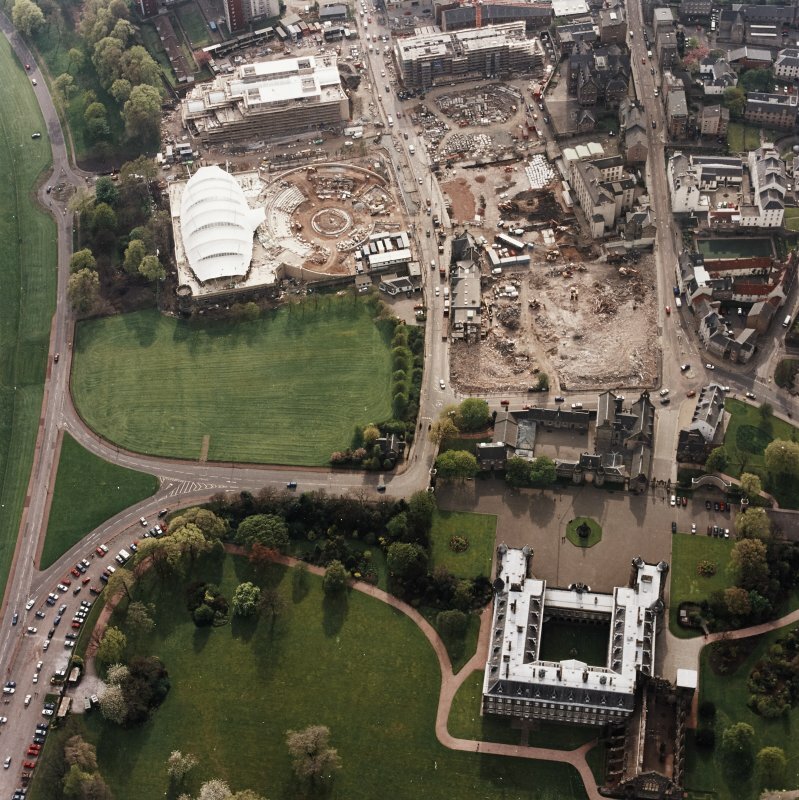 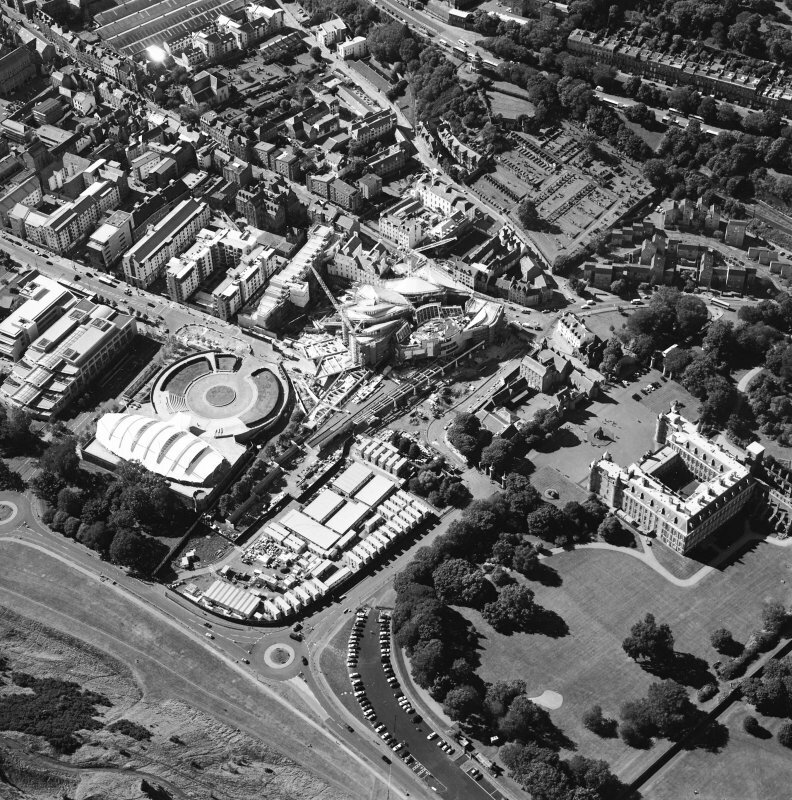 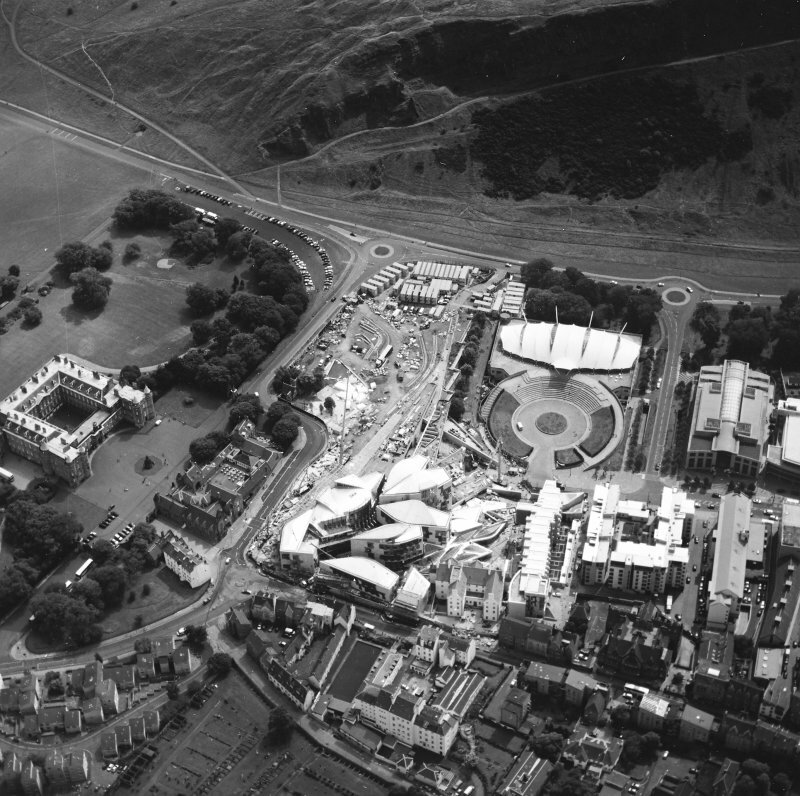 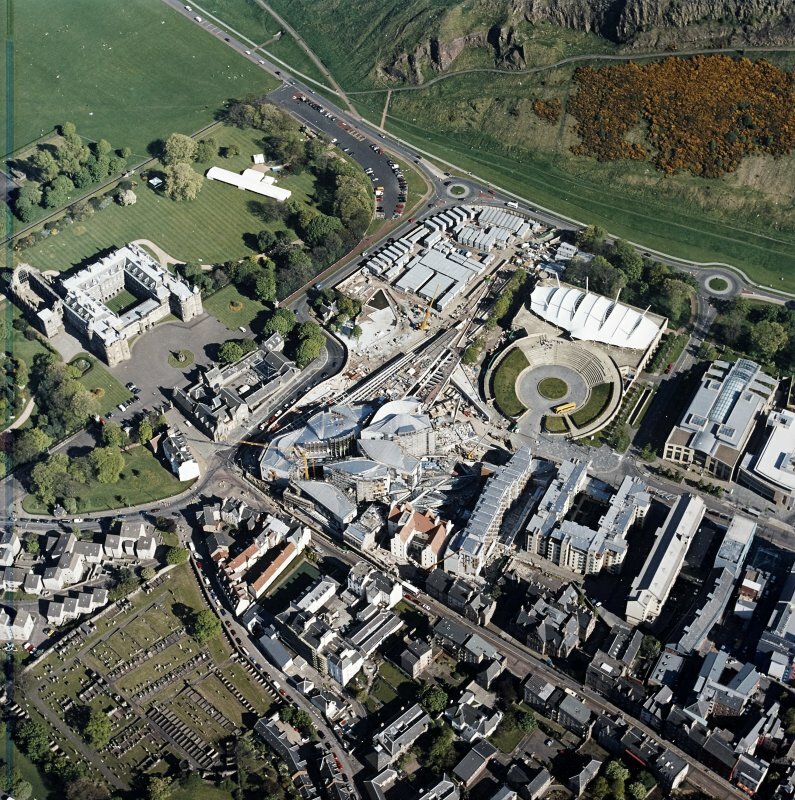 Oblique aerial view centred on Holyrood Palace, Abbey, Parliament building and 'Our Dynamic Earth', taken from the West. 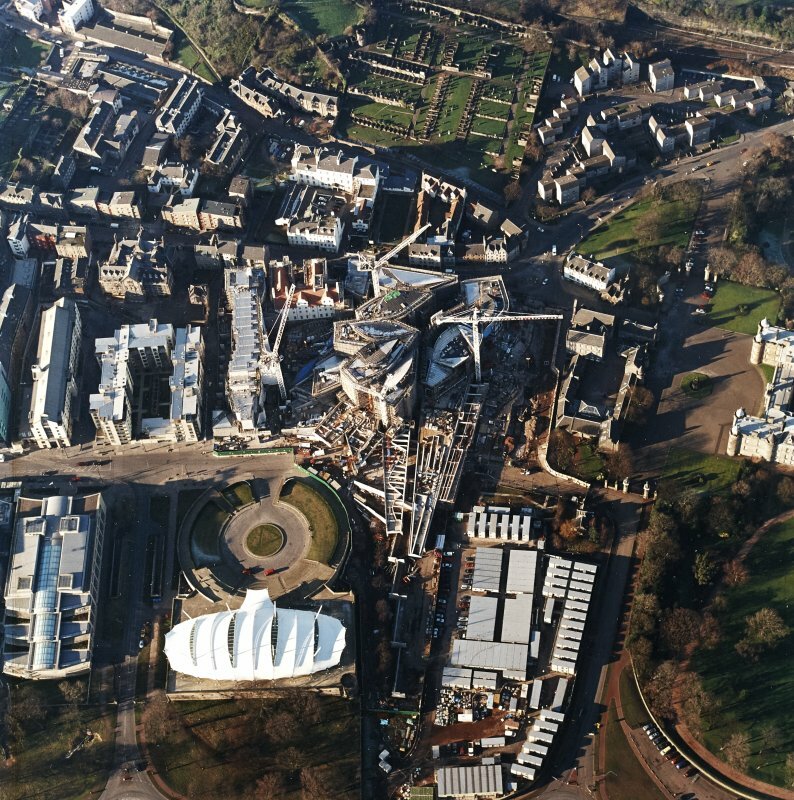 Oblique aerial view centred on the construction of the Scottish Parliament, with 'Our Dynamic Earth' adjacent, taken from the SE. 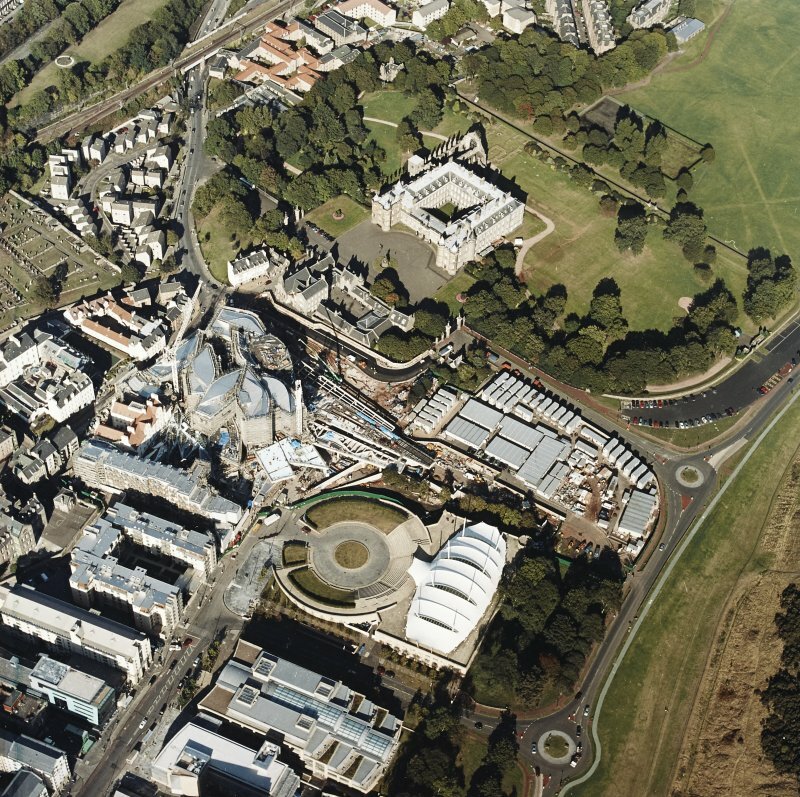 Oblique aerial view of Edinburgh centred on both 'Dynamic Earth' and the Scottish Parliament under construction, with the Canongate, Holyrood Palace and Holyrood Abbey adjacent, taken from the WSW. 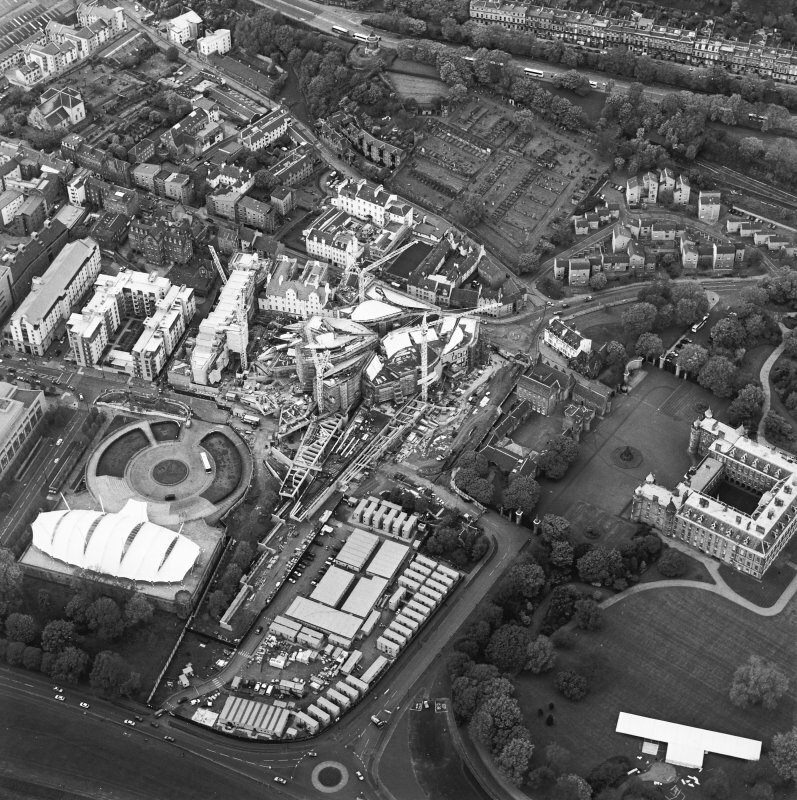 Oblique aerial view of the Scottish Parliament, looking W.
Oblique aerial view of Edinburgh centred on both 'Dynamic Earth' and the Scottish Parliament under construction, and a view of the Canongate, Holyrood Palace and Holyrood Abbey, taken from the W.
Oblique aerial view centred on the construction of the Scottish Parliament with the exhibition centre and palace adjacent, taken from the N.
Oblique aerial view centred on the construction of the Scottish Parliament with Our Dynamic Earth, Queensbury House and Holyrood Palace adjacent, taken from the WSW. 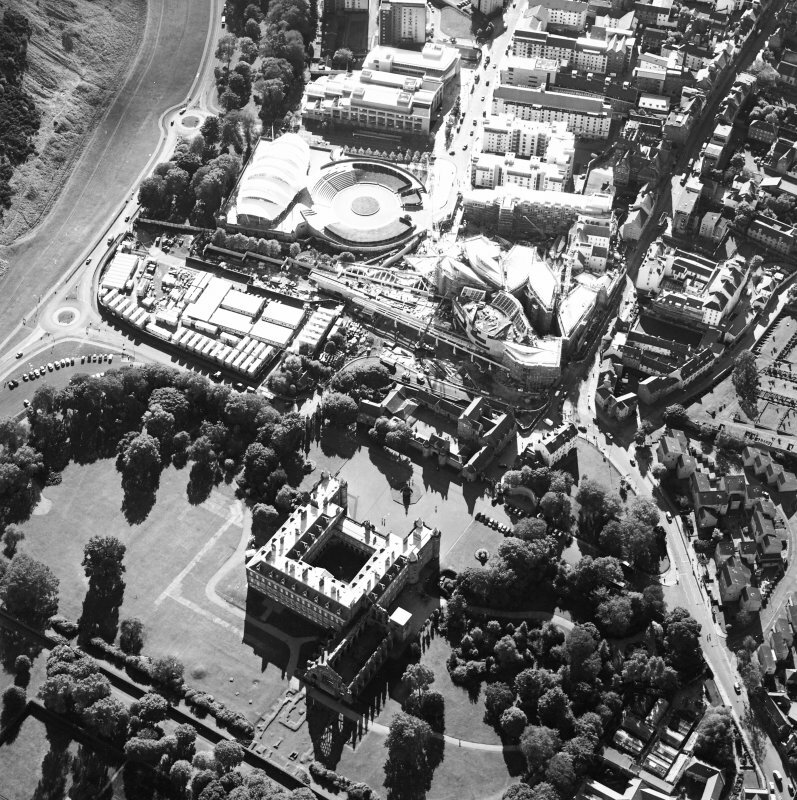 Oblique aerial view of Edinburgh centred on the construction of the Scottish Parliament with the 'Our Dynamic Earth' building and Holyrood Palace adjacent, taken from the E.
Oblique aerial view centred on the construction of the Scottish Parliament with `Our Dynamic Earth and Queensberry House adjacent, taken from the SE. 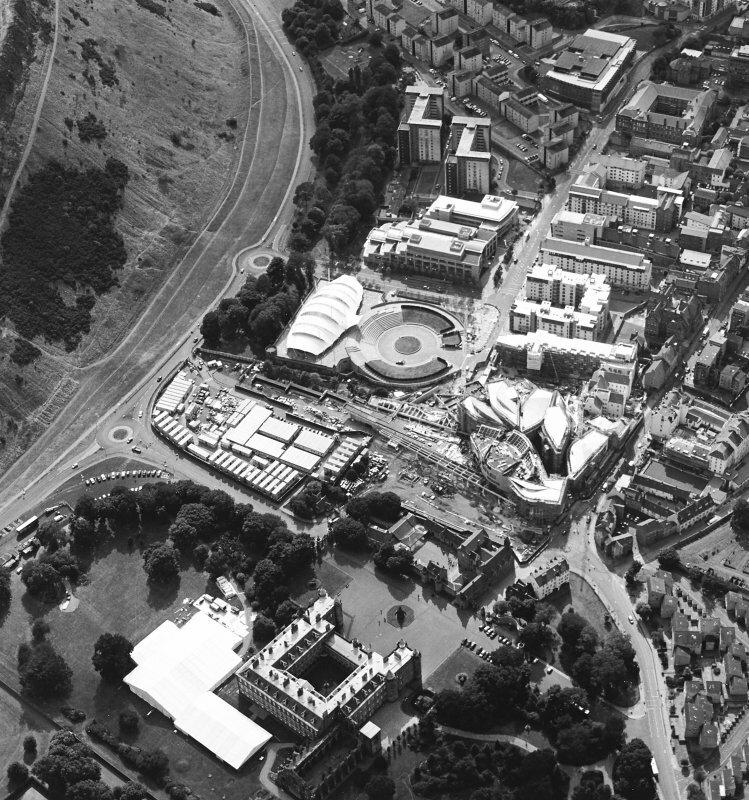 Oblique aerial view centred on the construction of the Scottish Parliament, with `Our Dynamic Earth¿, Queensberry House and Holyrood Palace adjacent, taken from the E.
Oblique aerial view centred on the construction of the Scottish Parliament with Our Dynamic Earth, Queensbury House and Holyrood Palace adjacent, taken from the ENE. 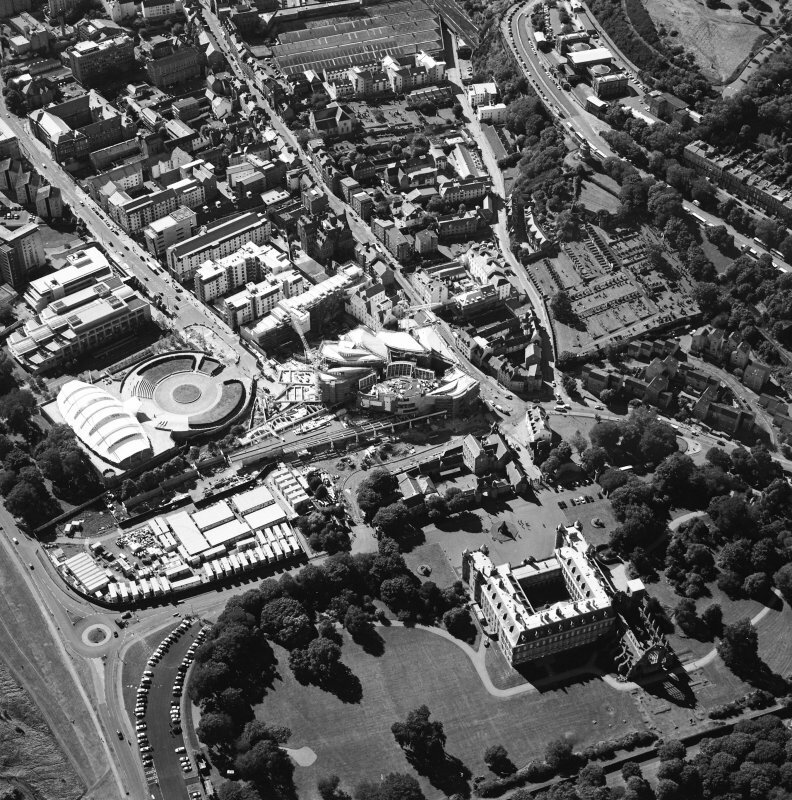 Oblique aerial view centred on the construction of the Scottish Parliament with Our Dynamic Earth, Queensbury House and Holyrood Palace adjacent, taken from the SW.
Oblique aerial view centred on the construction of the Scottish Parliament with Our Dynamic Earth, Queensbury House and Holyrood Palace adjacent, taken from the NW. 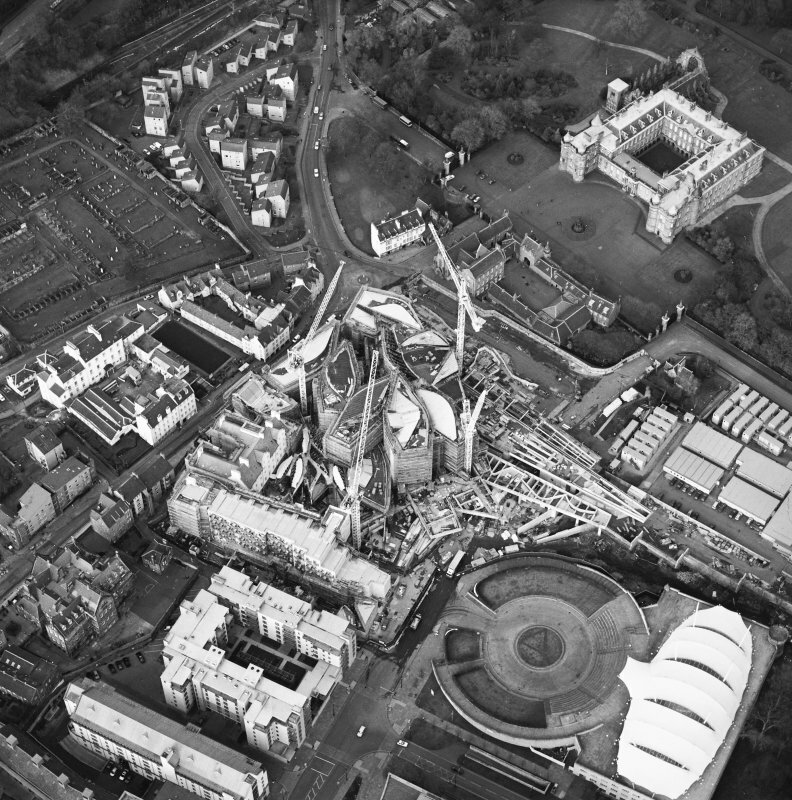 Oblique aerial view centred on the construction of the parliament, taken from the E.
Oblique aerial view centred on the construction of the parliament, taken from the SW.
Oblique aerial view centred on the construction of the Scottish Parliament with the exhibition centre adjacent, taken from the N.
Oblique aerial view centred on the construction of the Scottish Parliament with the exhibition centre adjacent, taken from the NNW. 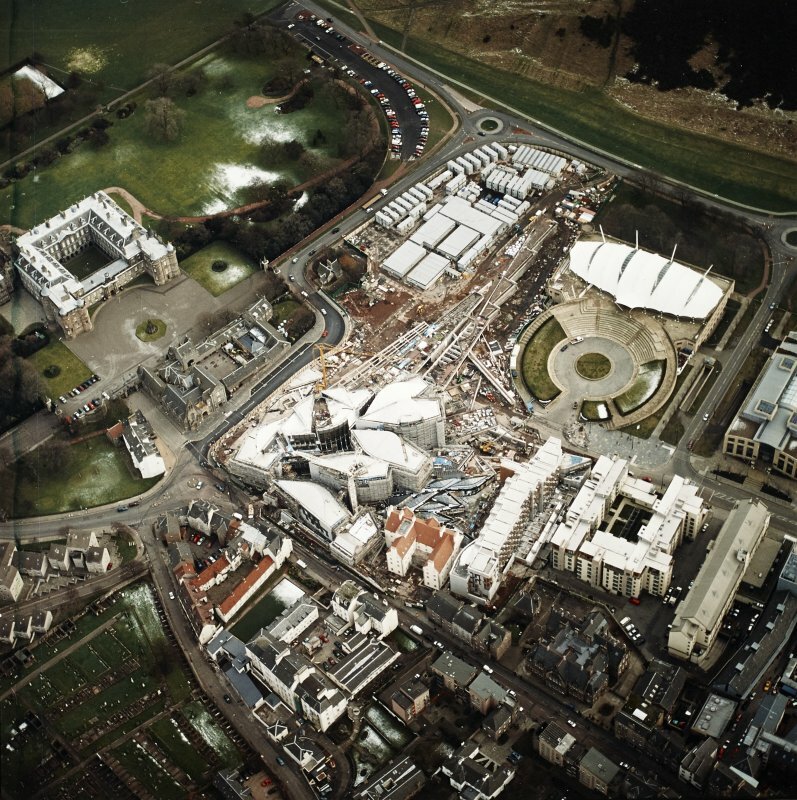 Oblique aerial view centred on the construction of the Scottish Parliament, taken from the S.
Oblique aerial view centred on the construction of the Scottish Parliament with exhibition centre and palace adjacent, taken from the SSW. 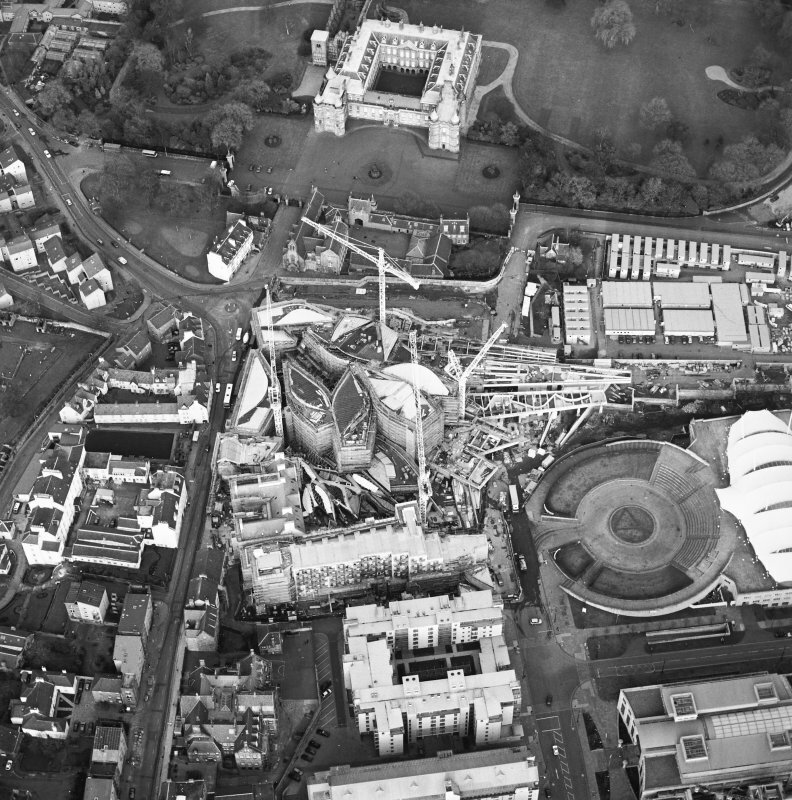 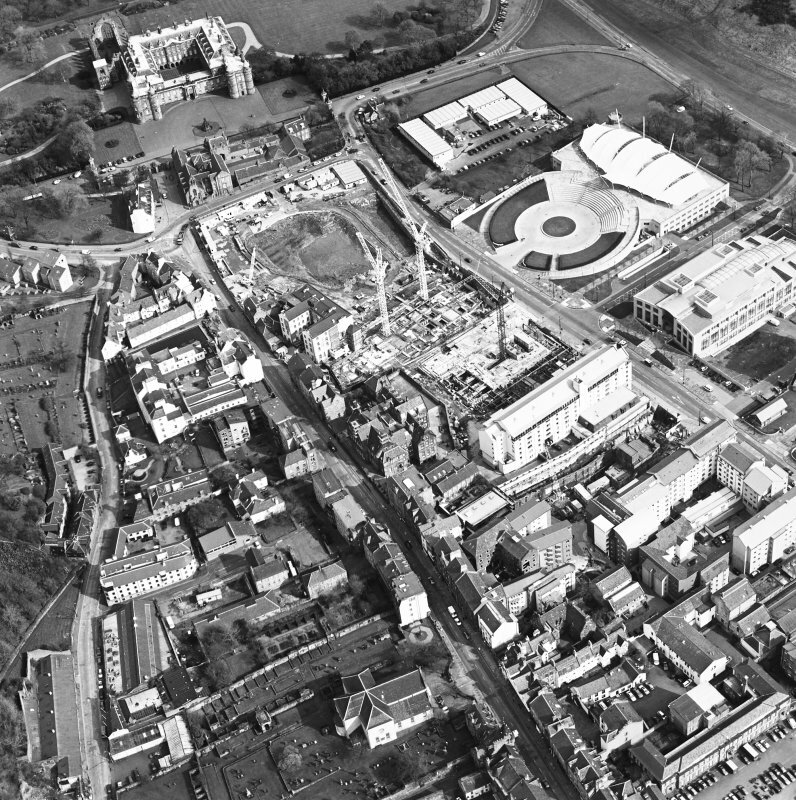 Oblique aerial view centred on the construction of the Scottish Parliament with exhibition centre and palace adjacent, taken from the WSW. 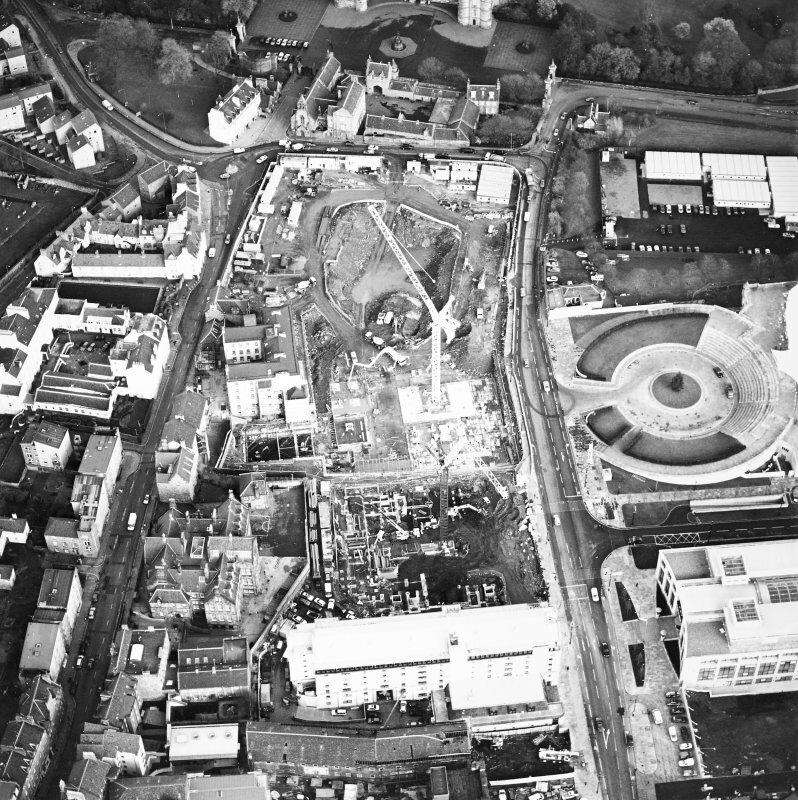 Oblique aerial view centred on the construction of the Scottish Parliament with exhibition centre adjacent, taken from the ENE. 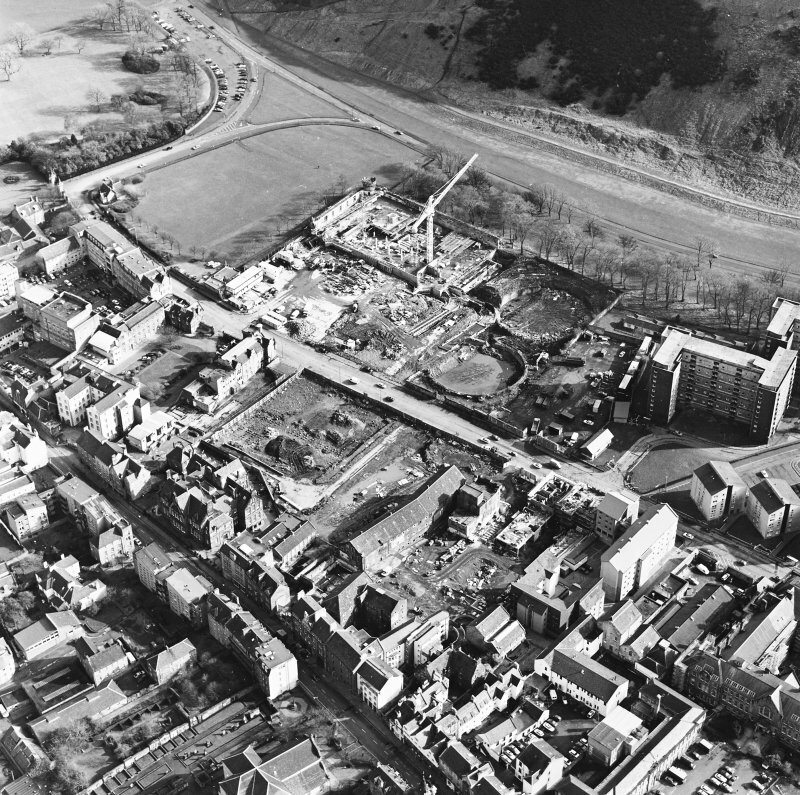 Oblique aerial view centred on the construction of the Scottish parliament, taken from the NW. 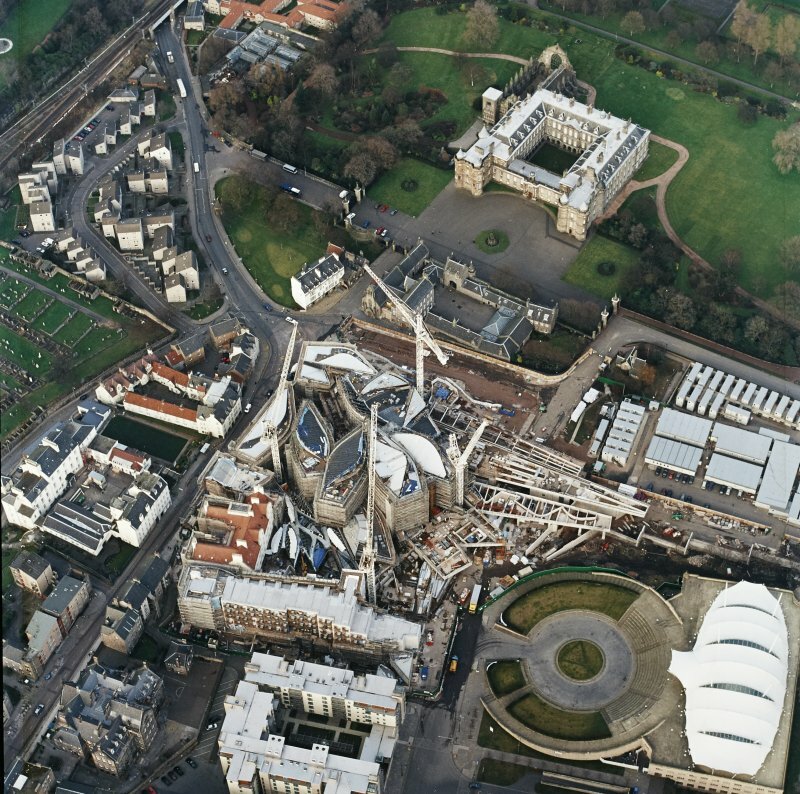 Oblique aerial view centred on the construction of the Scottish Parliament, with `Our Dynamic Earth¿ and Holyrood Palace adjacent, taken from the WSW. 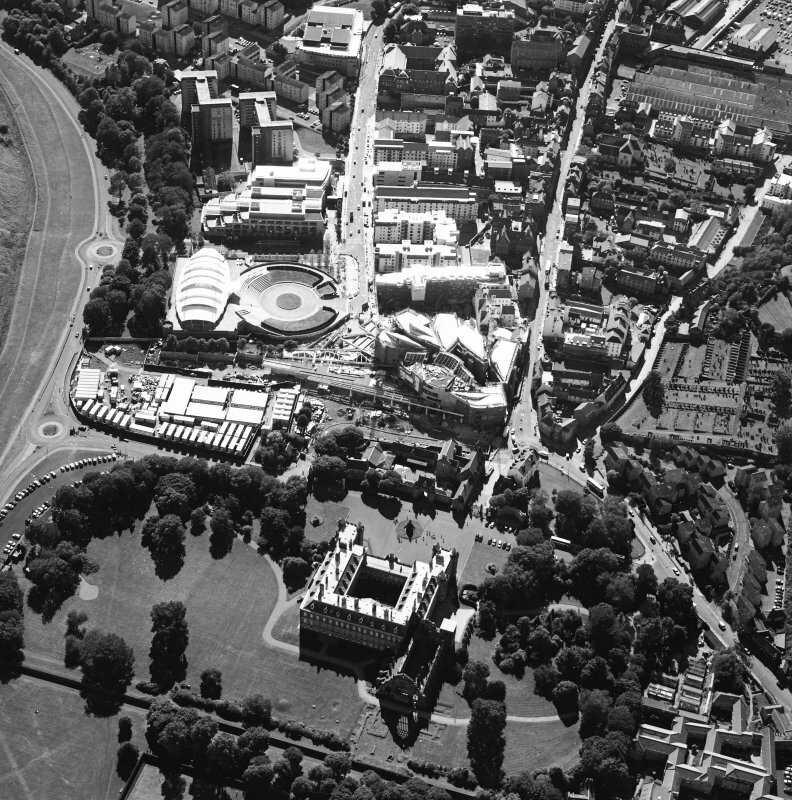 Oblique aerial view of Edinburgh centred on the construction of the Scottish Parliament with the 'Our Dynamic Earth' building and Holyrood Palace adjacent, taken from the NE. 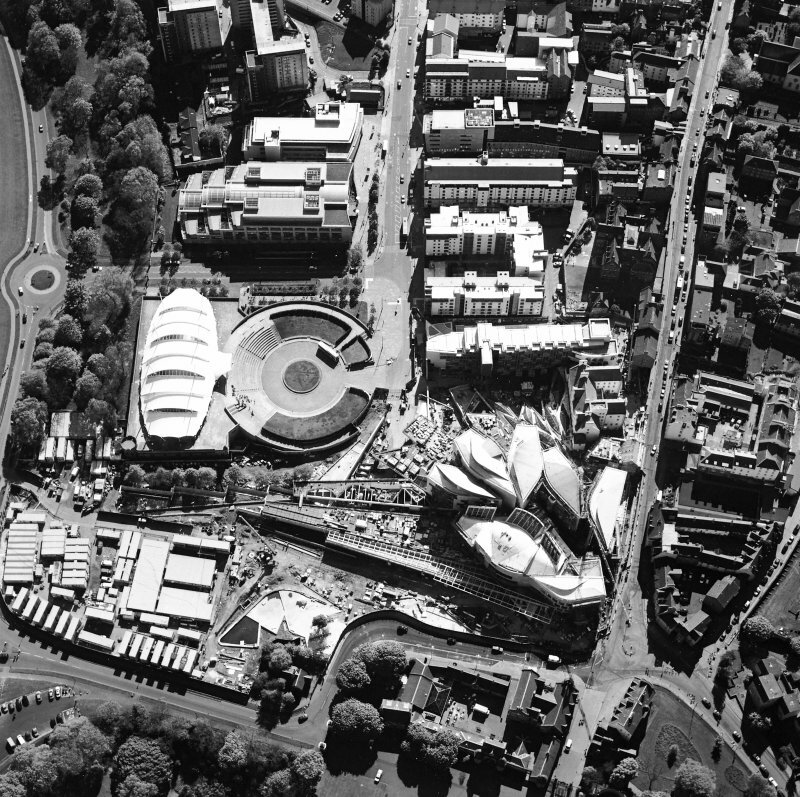 Oblique aerial view of the Edinburgh, Scottish Parliament (under construction) centred on the Parliament building with an exhibition and conference centre adjacent, taken from the SE. 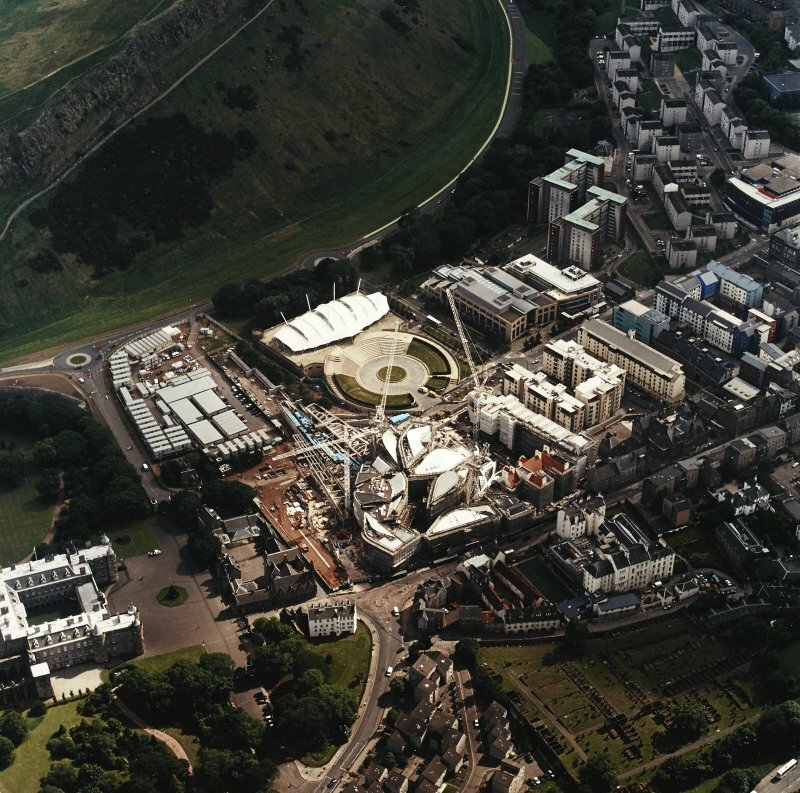 In 1998 Holyrood was chosen as the location for the new Scottish Parliament building after consideration of a number of sites in Edinburgh. 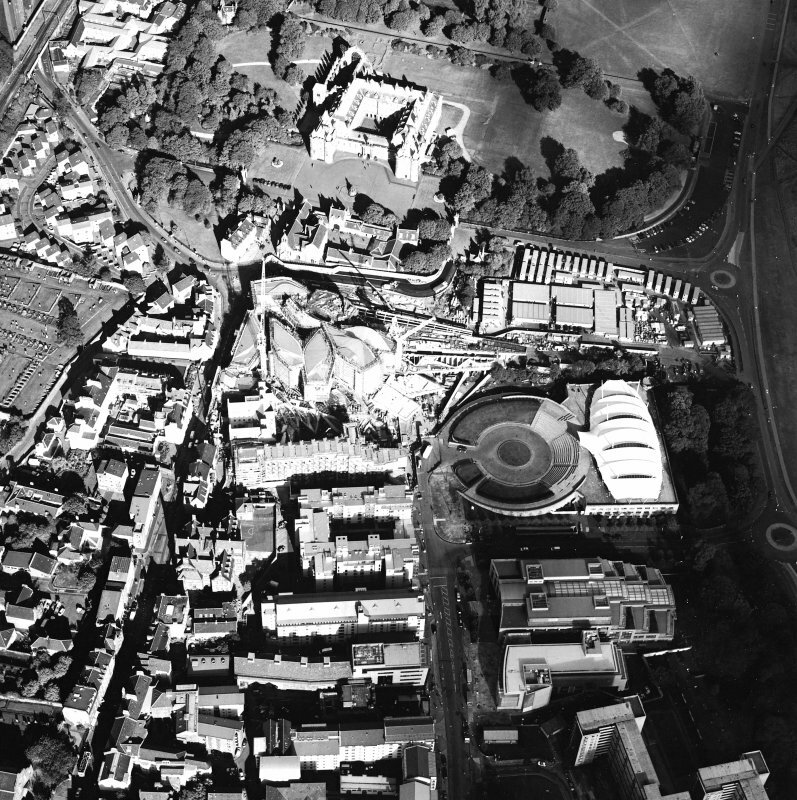 The parliament complex, comprising offices, administration centre, debating chamber and committee rooms, was designed by the Catalan architect Enric Miralles and incorporates the 17th century Queensberry House within the building complex. 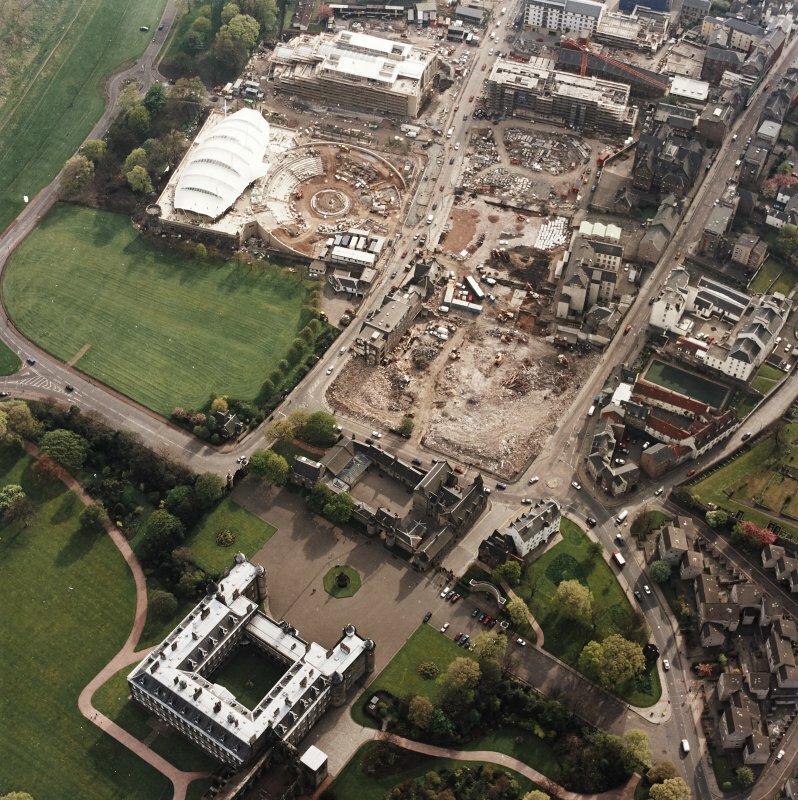 Kirkdale Archaeology carried out archaeological monitoring of the site of the new parliament for Scotland during borehole survey. 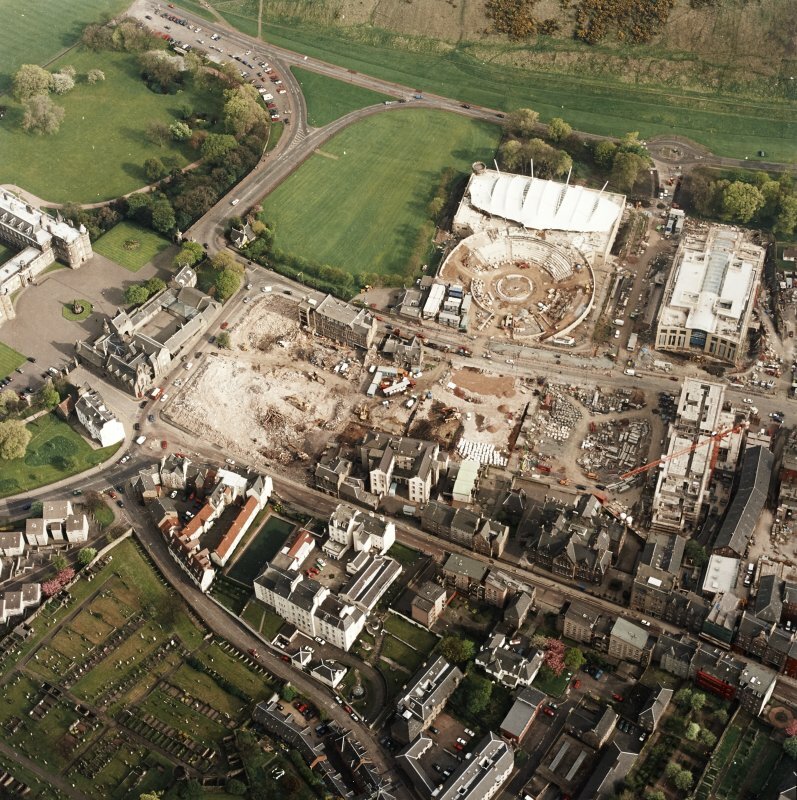 The fieldwork took place over 4th-5th June, and 12th June 1998. 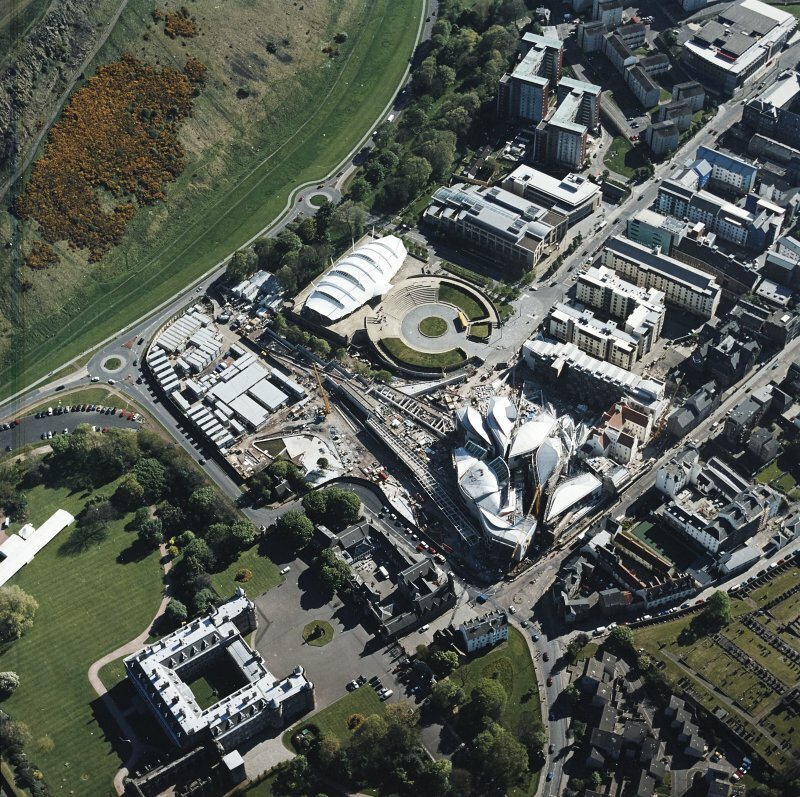 NT 2671 7388 A total of 11 test pits were monitored, 1 May 2009–1 March 2010, prior to and during the erection of security barriers and bollards around the Scottish Parliament. 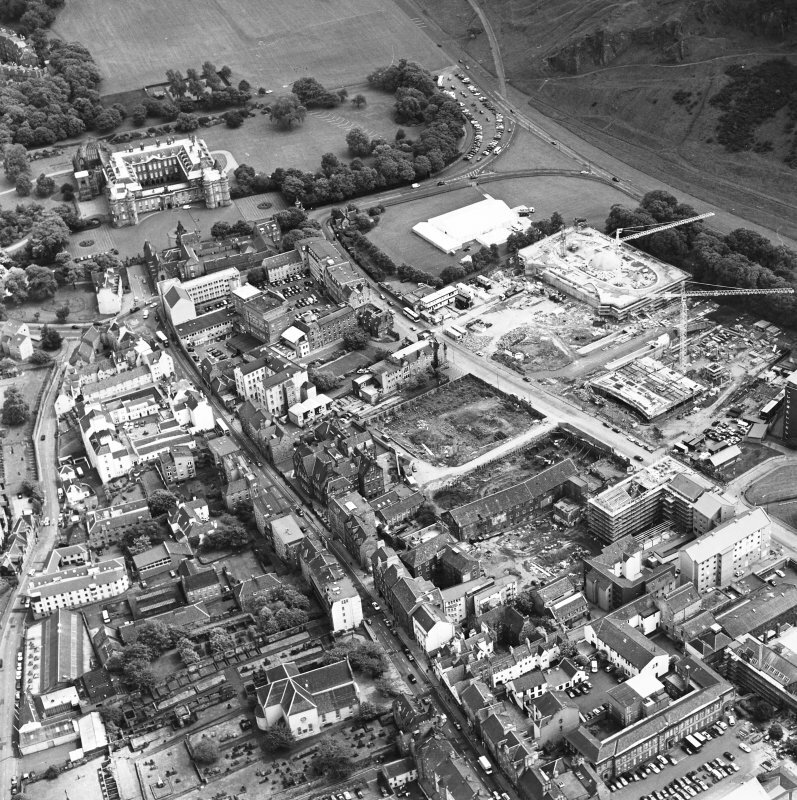 The test pits reached a depth of c1m and encountered modern made ground and services. 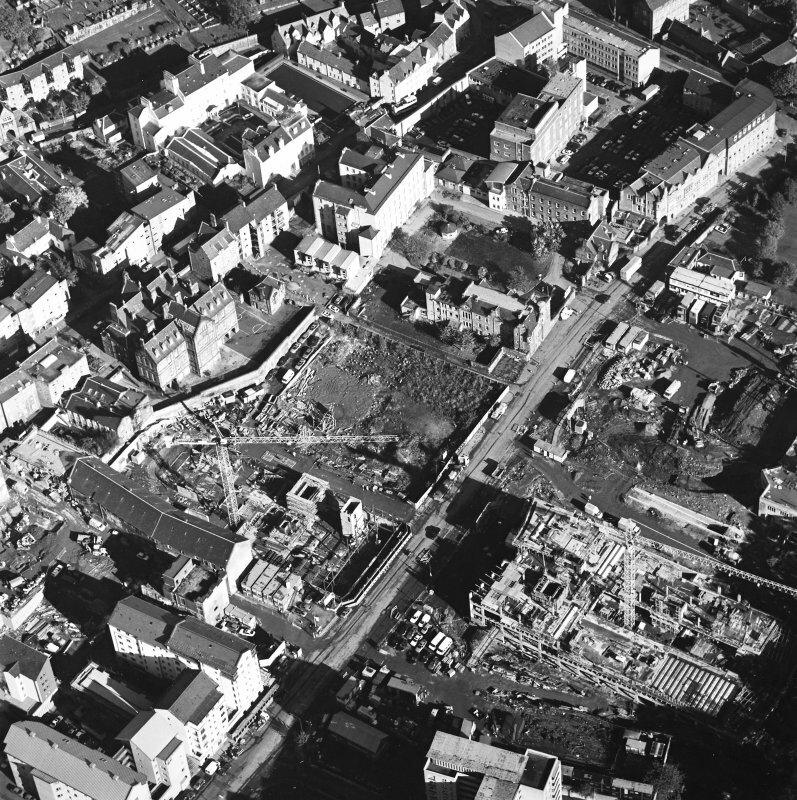 A post-medieval loam/garden soil was recorded at Reid’s Close. 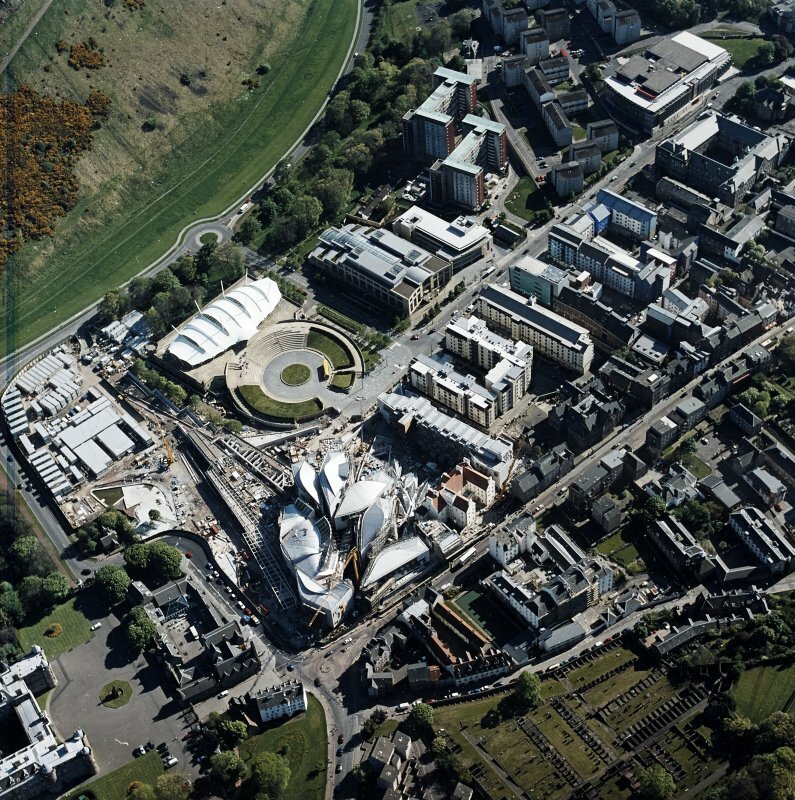 The elegant sterling silver sculpture brings together the three honours of Scotland, the crown, sword and sceptre, into a simplified flowing whole. 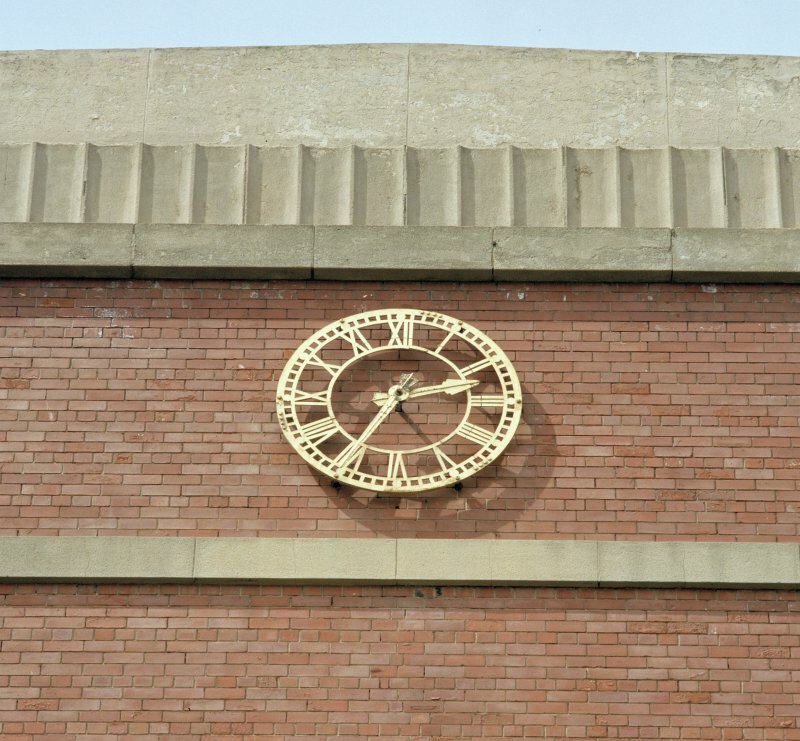 The central square-sectioned sceptre is topped by a smooth rock crystal, echoing the rock crystal in the real sceptre, with an oak-leaf engraved sphere below it (this relates to the orb in the crown). 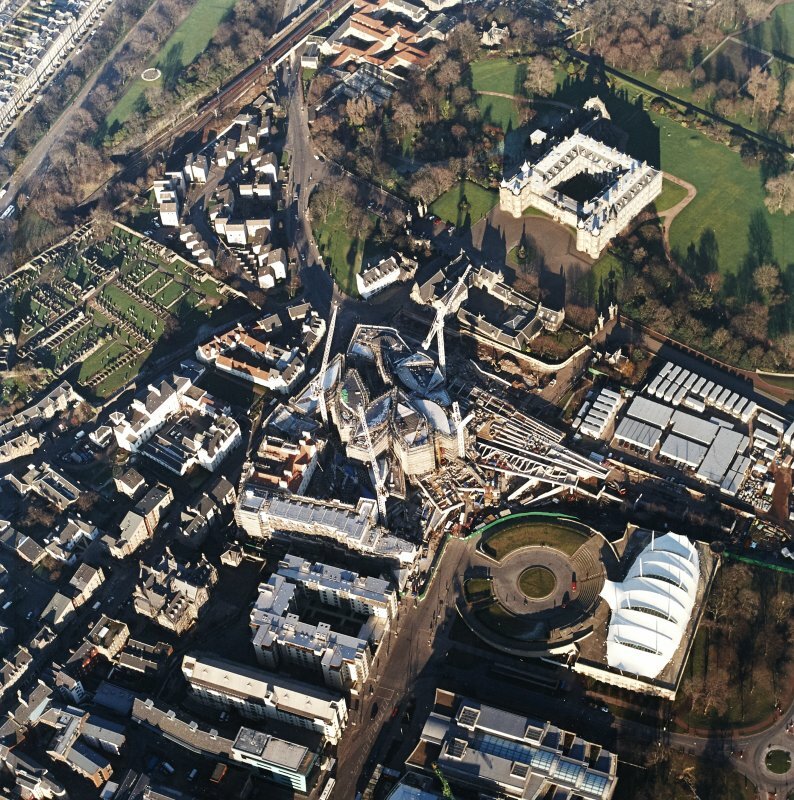 From near the bottom of the vertical axis, two moebius strips curve out, representing the crown, and derived from its arches, the broken-off point of the sword intersects the front moebius loop, pointing upwards at the angle of a St Andrew's Cross, thus creating a version of the Saltire. 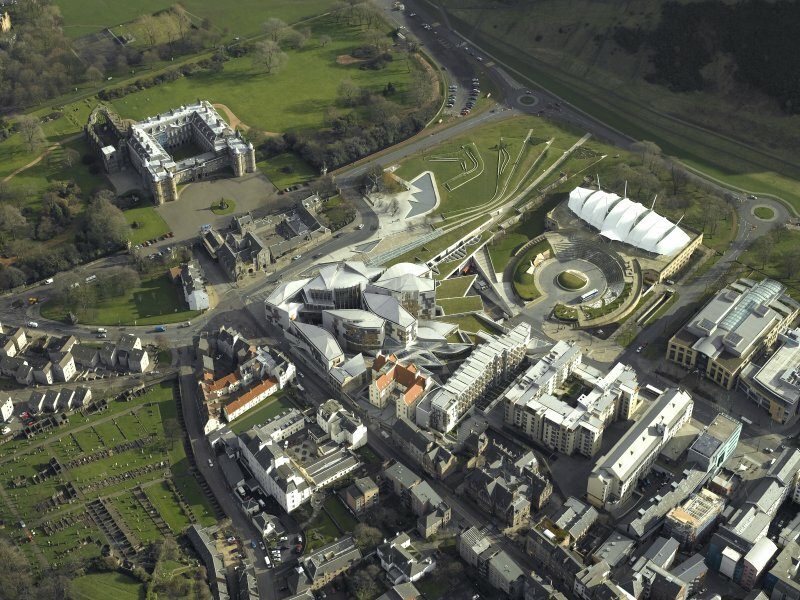 The moebius strip represents for the artist 'an unending, continuous journey, one of returning and renewal.' 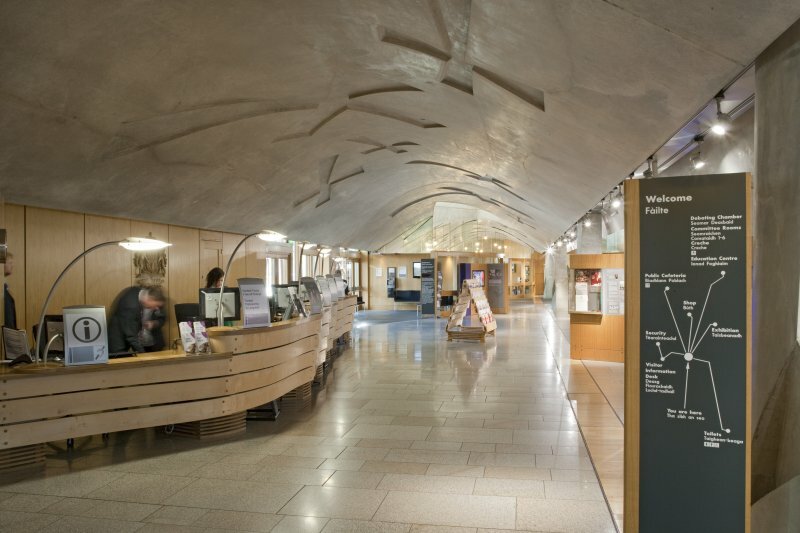 (1) According to Graham Stewart, the oak leaves on the orb refer to the oldest part of the Scottish crown: the oak leaves taken by the goldsmith John Mosman from the previous crown to add to the present crown, made in 1540 for James V. Inside the oak leaves on the orb are wavy lines, which echo those cast in concrete on the ceilings in the Scottish Parliament Building, and suggest contour maps: a reference to the land, and a tribute to the architect of the Scottish Parliament Building, Enric Miralles. 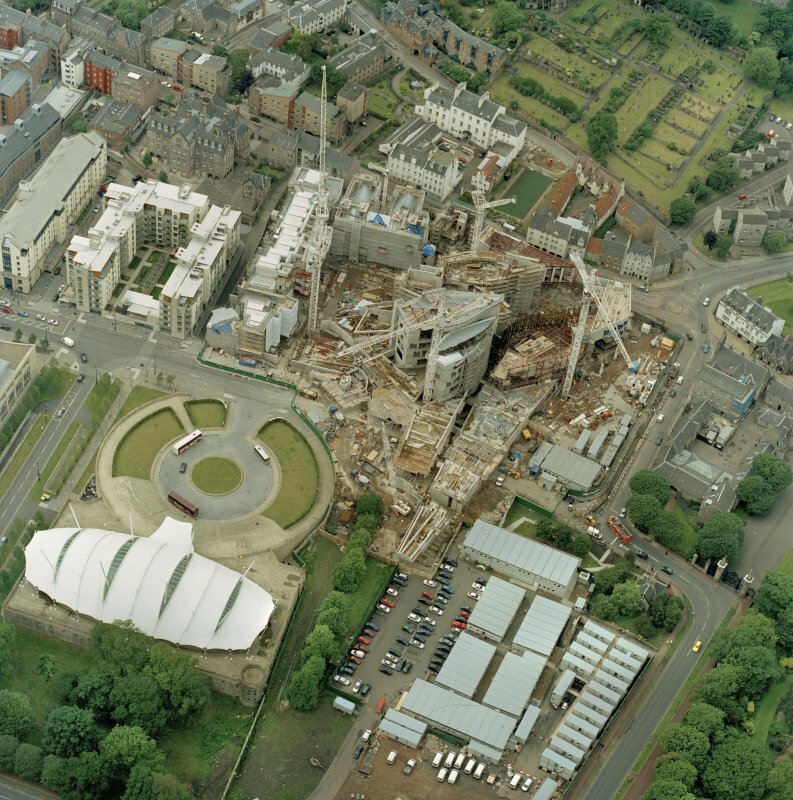 Graham Stewart liked the idea of the old and new combined. 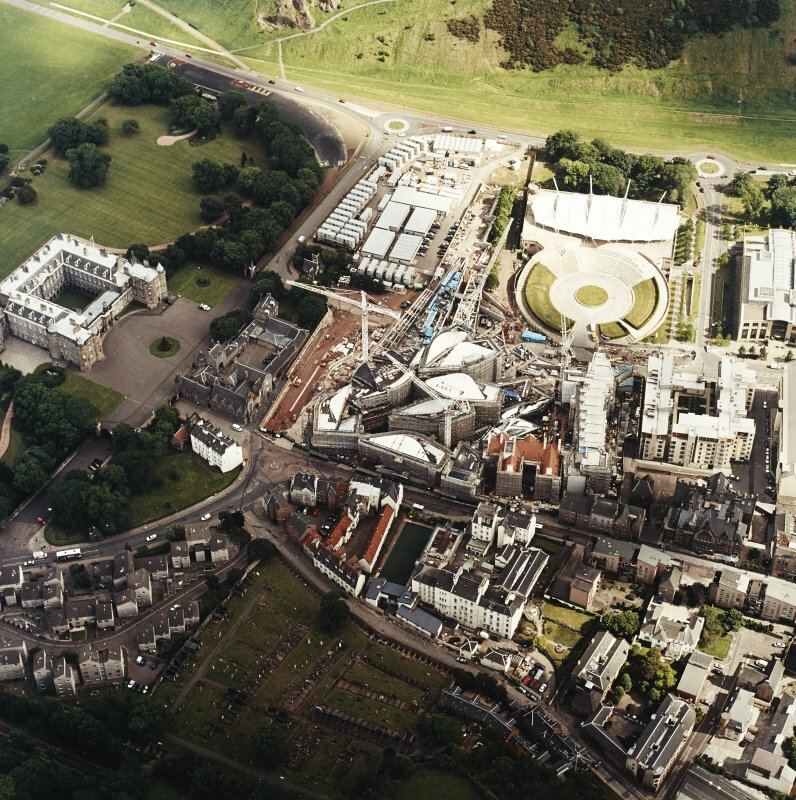 In 2004 Graham Stewart and a number of other Scottish silversmiths, were invited by the Incorporation of Goldsmiths of the City of Edinburgh, to submit a design for a silver sculpture for the new Scottish Parliament Building, to be presented by Her Majesty The Queen at the opening ceremony. 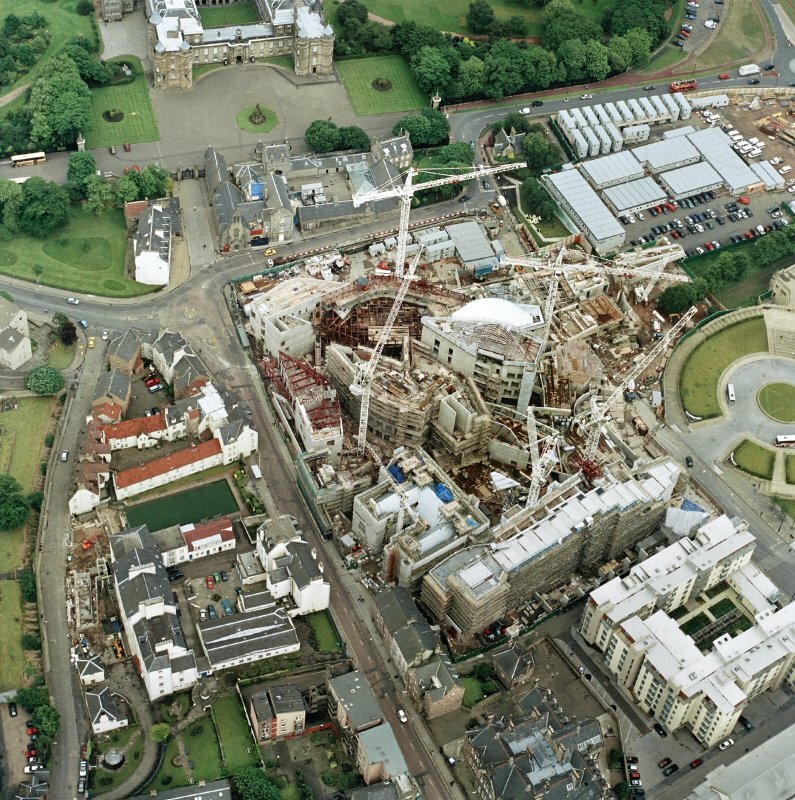 The sculpture was to be abstract, and to incorporate the symbolism of the Honours of Scotland. 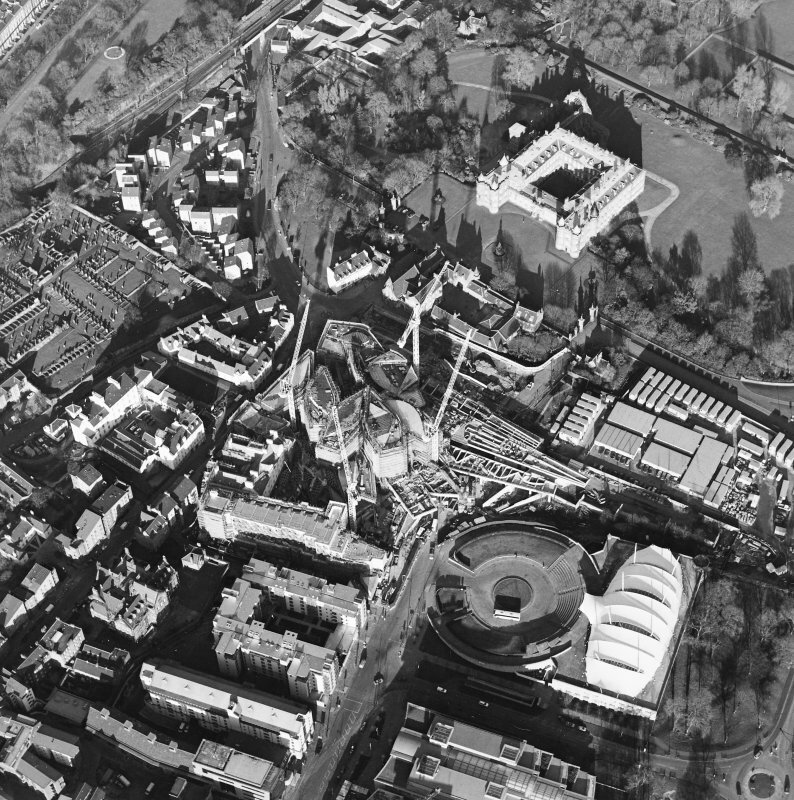 Stewart's design was selected. 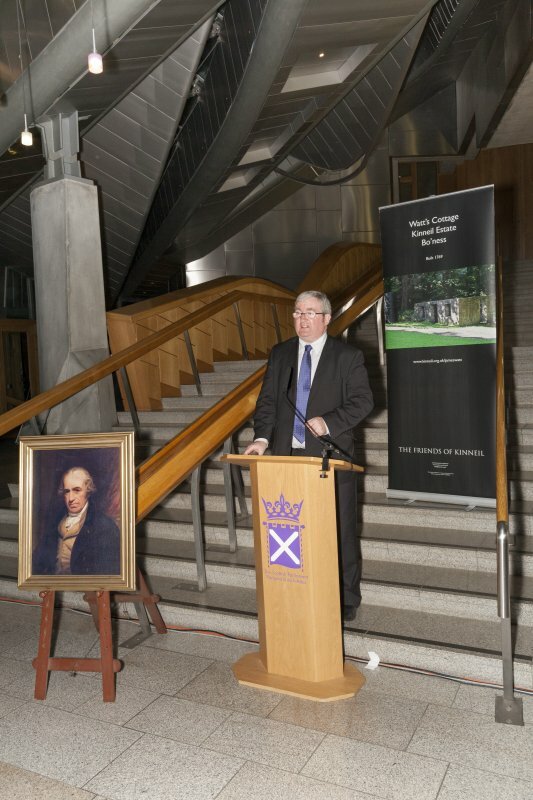 The Honours of Scotland are the crown, sword and sceptre, and are Scotland's crown jewels. 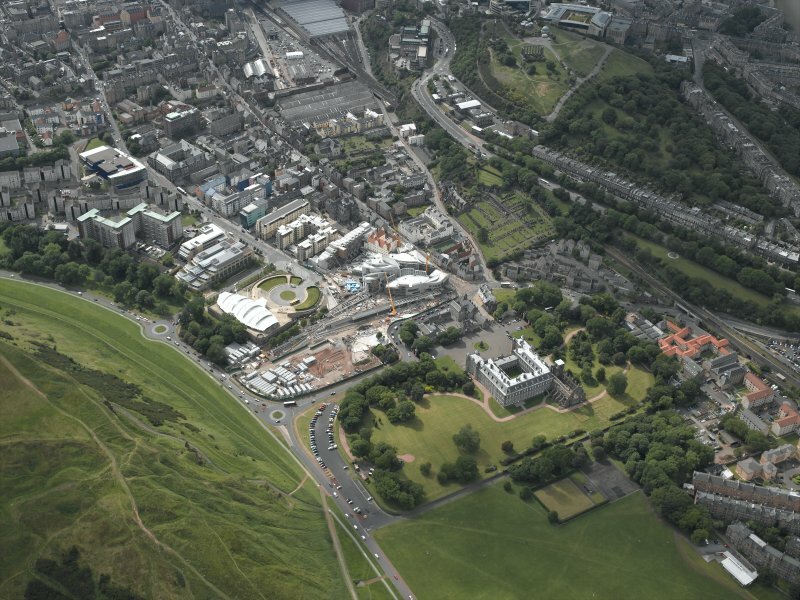 They are the oldest royal regalia in the U.K. and are kept in the Crown Room at Edinburgh Castle. 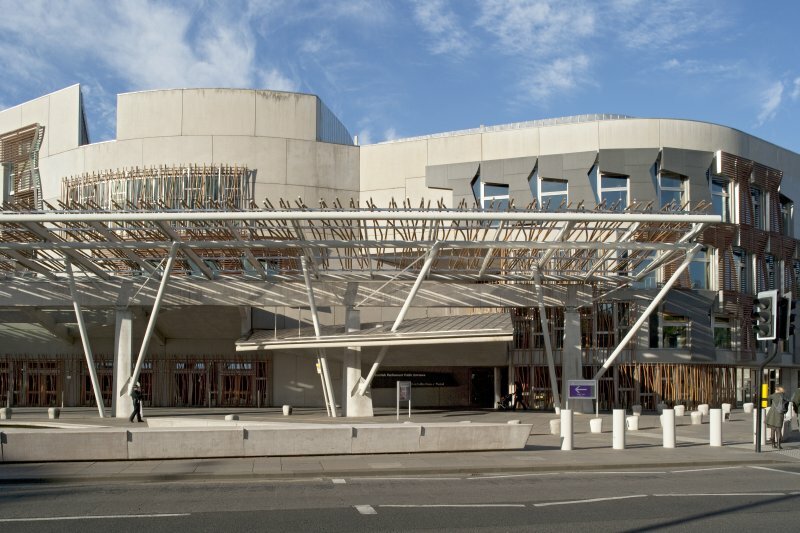 Signatures : Silversmith's maker's mark (GLS within a shield) is the highest of the five hallmark symbols arranged vertically on the lowest part of the sceptre. 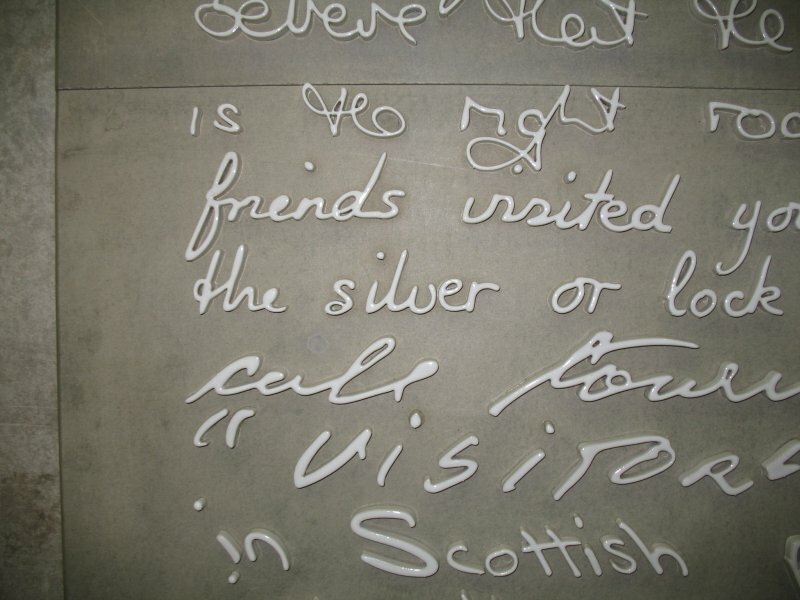 A collection of 100 sentences, each in individual handwriting, is re-created in white glazed porcelain and presented on three floor-to-ceiling wall boards. 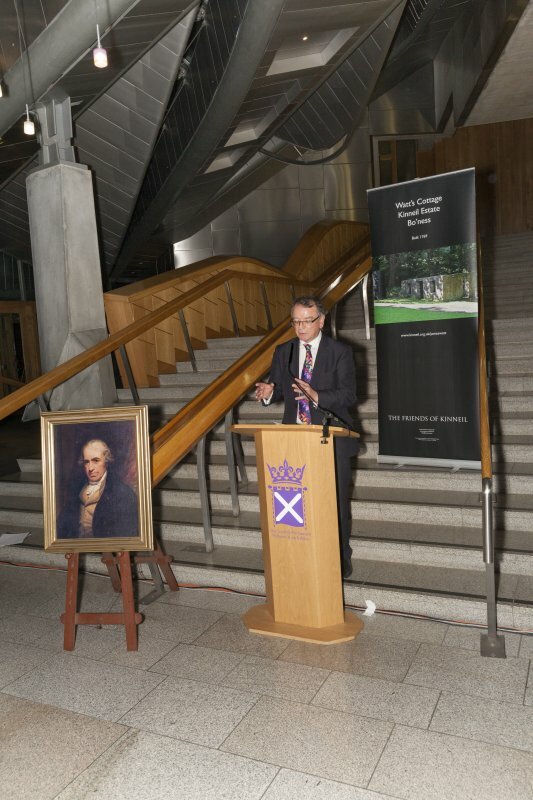 Originally, the brief was to recognise in an imaginary way the contribution of women who had campaigned for equal suffrage, and helped to further democracy. 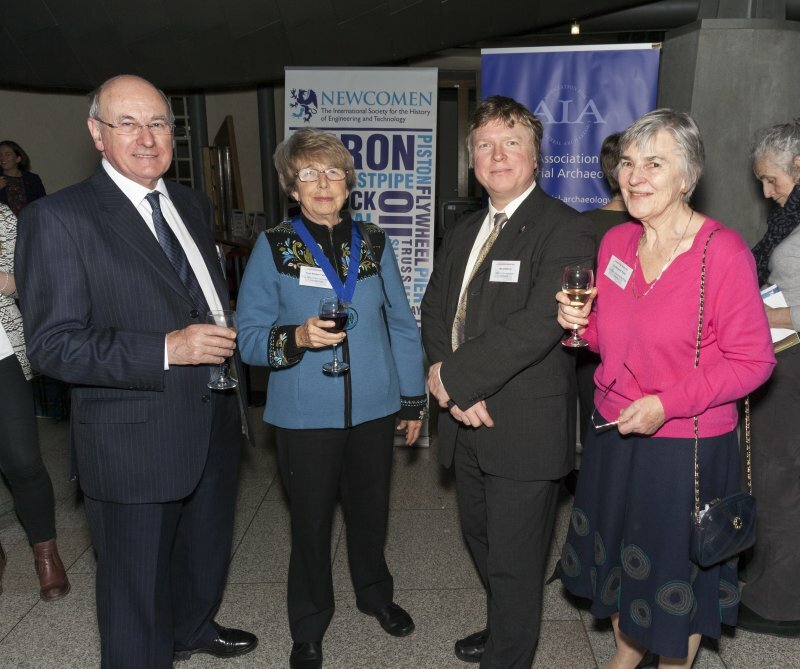 This was broadened to include all women who had made a significant contribution to life, culture or democracy in Scotland. 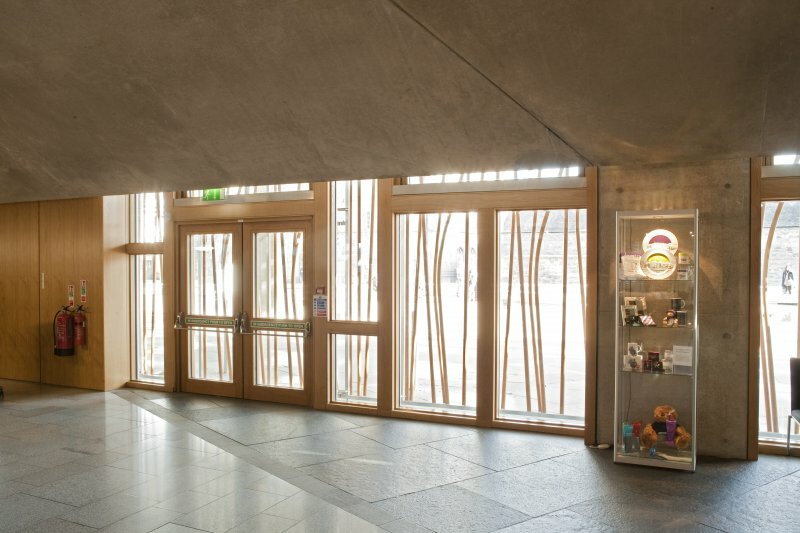 The artist undertook a journey across Scotland to meet 100 women, each woman being asked to refer her to another woman. 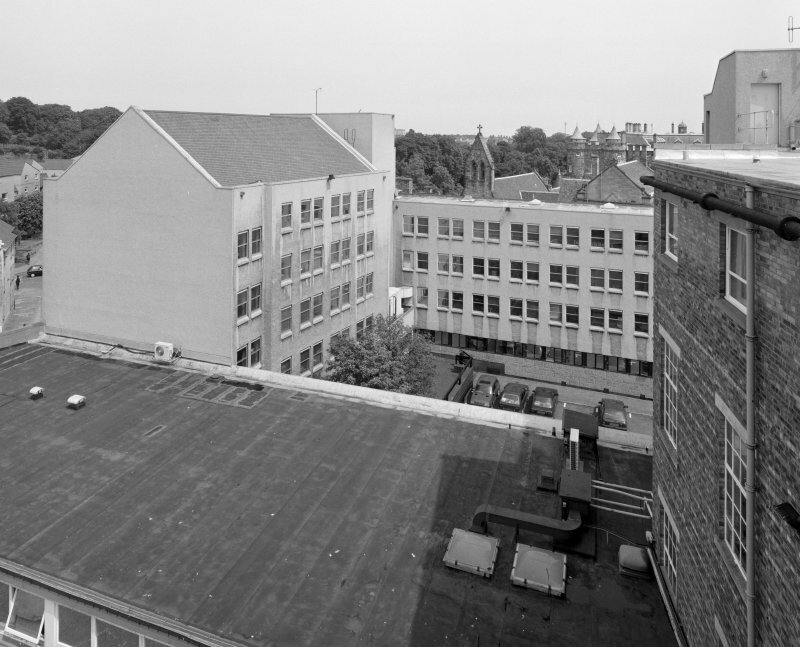 Each wrote a sentence about a woman she felt had made an important contribution. 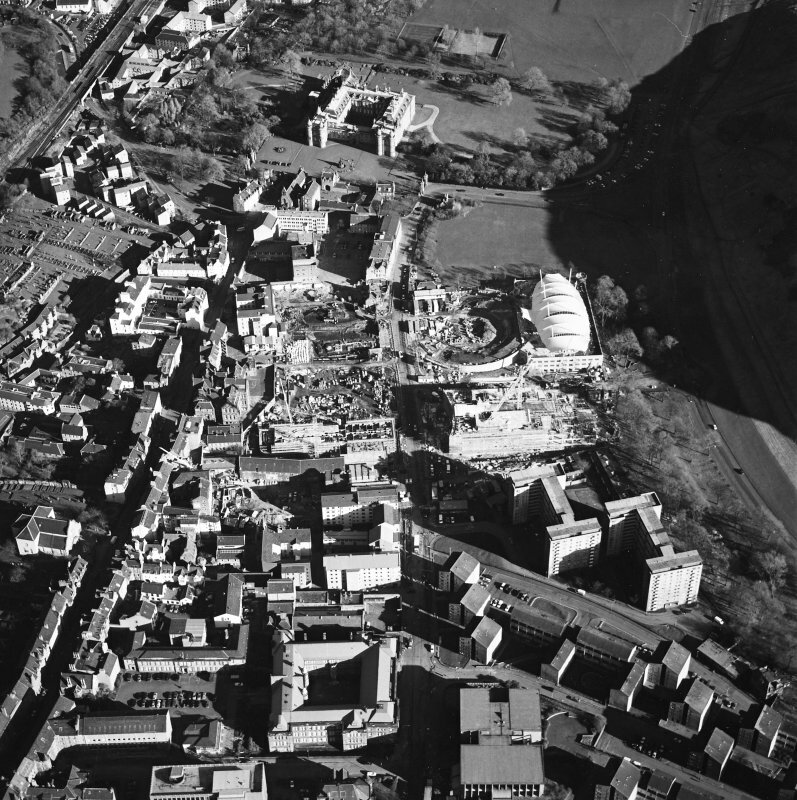 Inscriptions : [The whole work could be regarded as an inscription (100 sentences)]. 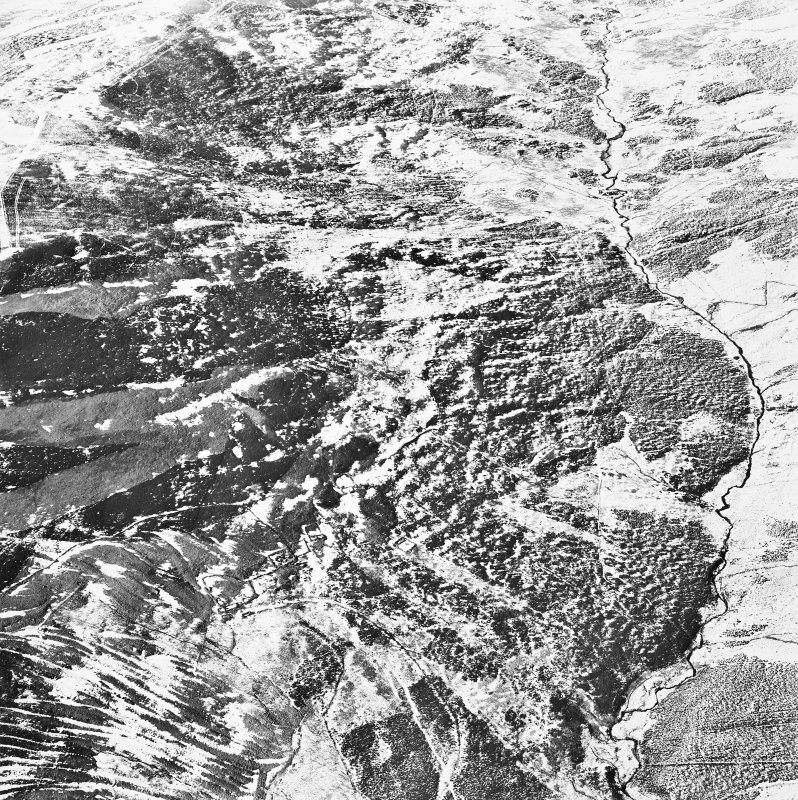 Signatures : None (but the artist wrote one of the sentences). 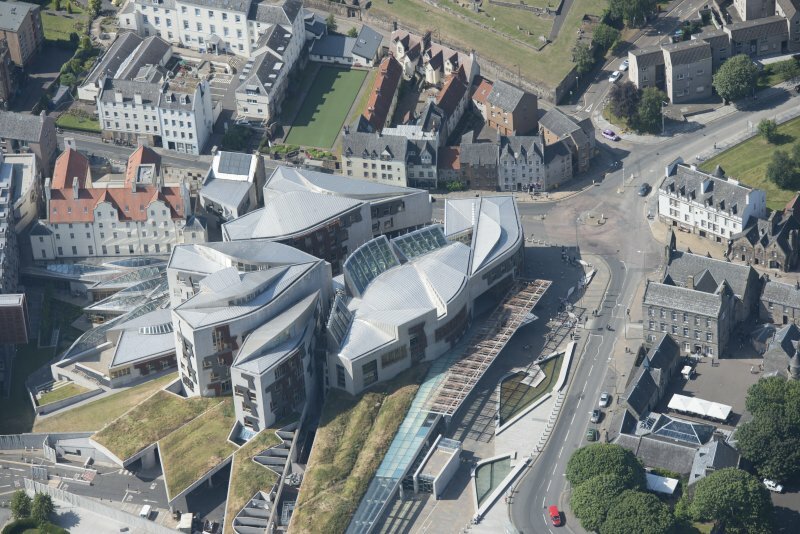 A watching brief was undertaken, 3 October 2017, during landscaping work within the Scottish Parliament Campus. 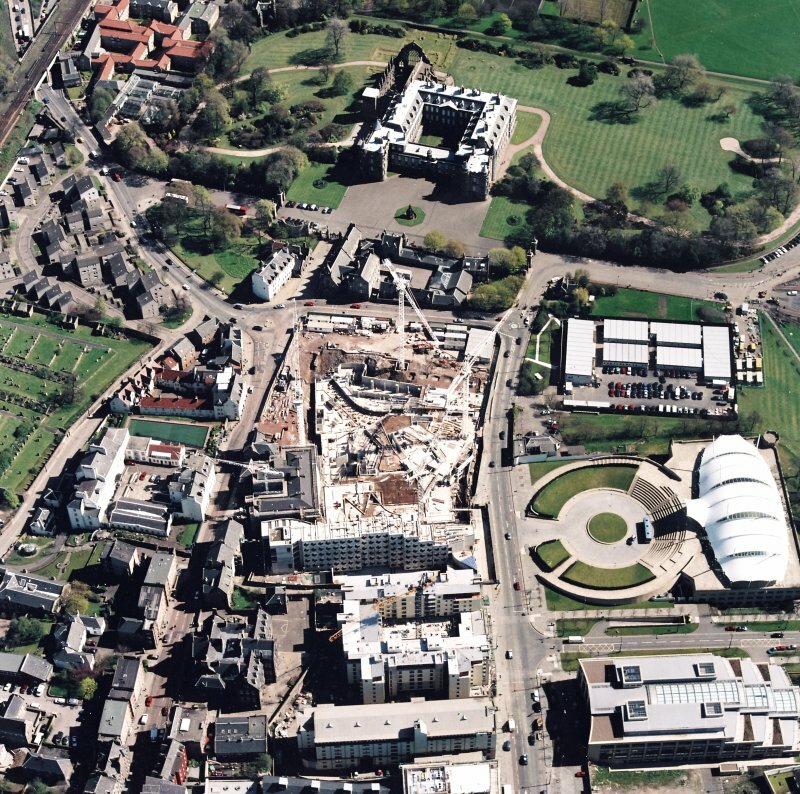 The only finds encountered in the topsoil were fragments of shell and Scottish reduced ware, which suggested the area had probably been used as a garden space. 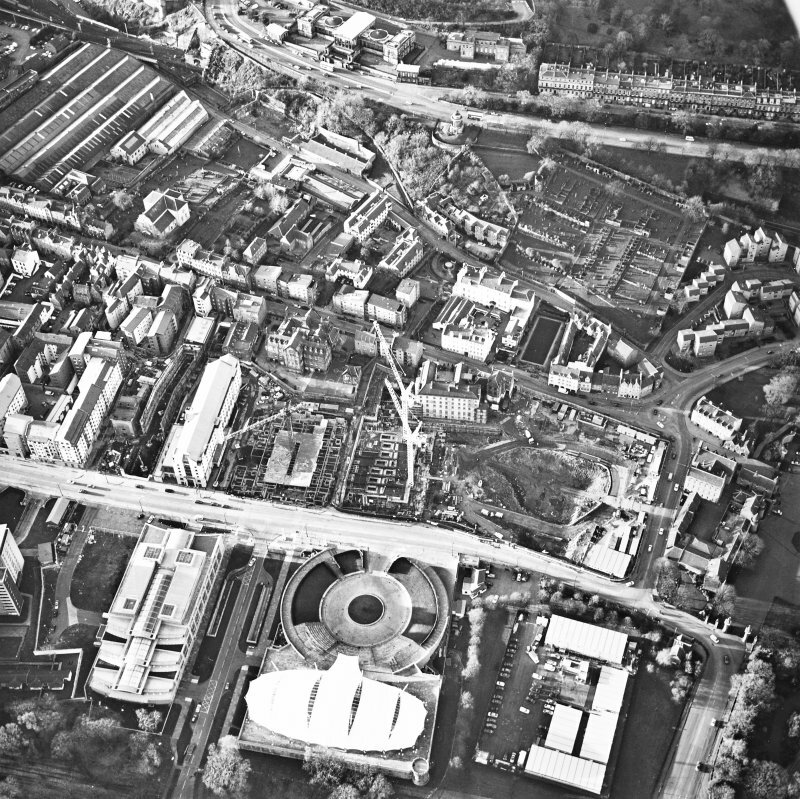 A selection of sites from the over-arching Scotstyle list which would potentially form a survey of the post-1975 buildings.